I’m back in North Carolina for a while and I’m going through my 20+ year treasure collection. 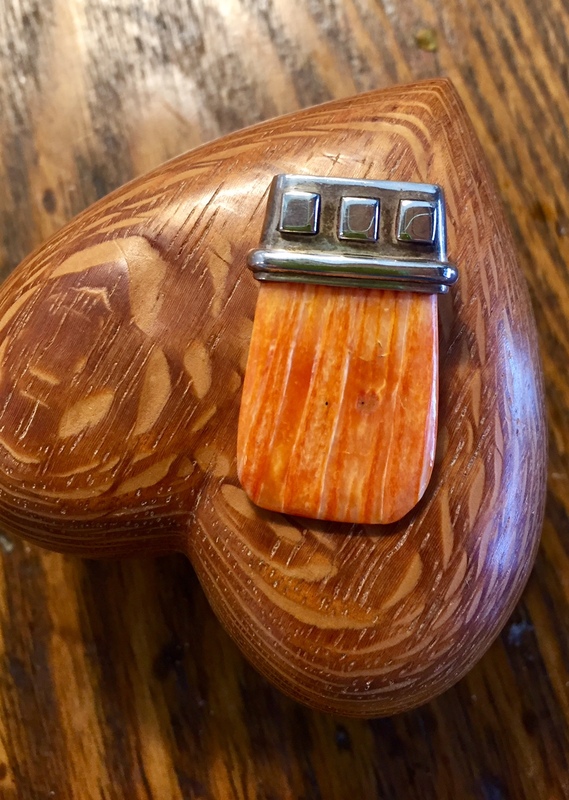 The pieces I’m offering for sale today are jewelry from the bygone years, an eclectic mix of “needed for professional life” or an “artistic point-of-view” that no longer fits my lifestyle. I’ll be listing an eclectic mix of pieces over the next weeks. Keep your eyes open! They are one-of-a-kind! You get first choice before I list these on eBay and in my Etsy shop. Nine (9) items offered today. Please email me with your interest (norma.schafer@icloud.com), plus address, specify August 13 and item number. I will calculate postage and send you an invoice. #1. SOLD. 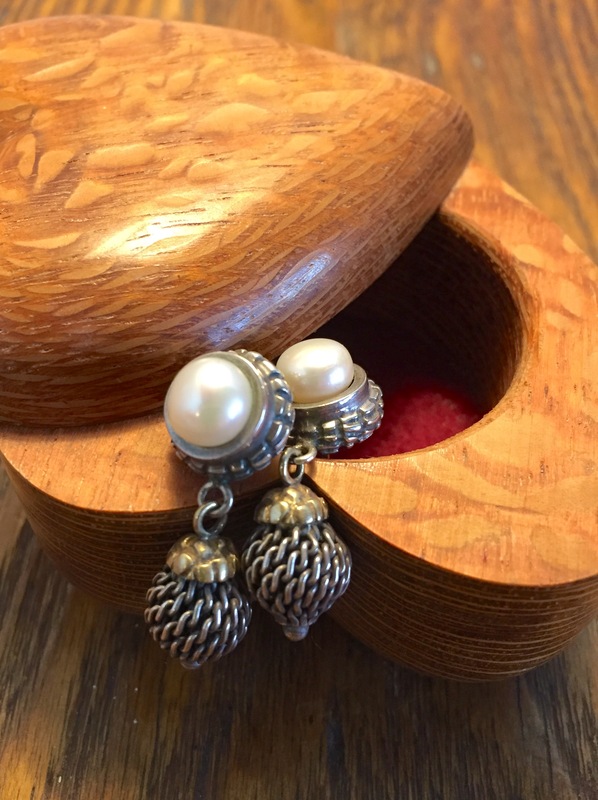 John Hardy Pearl, 18K Gold and 925 Silver Earrings. 14K gold posts. 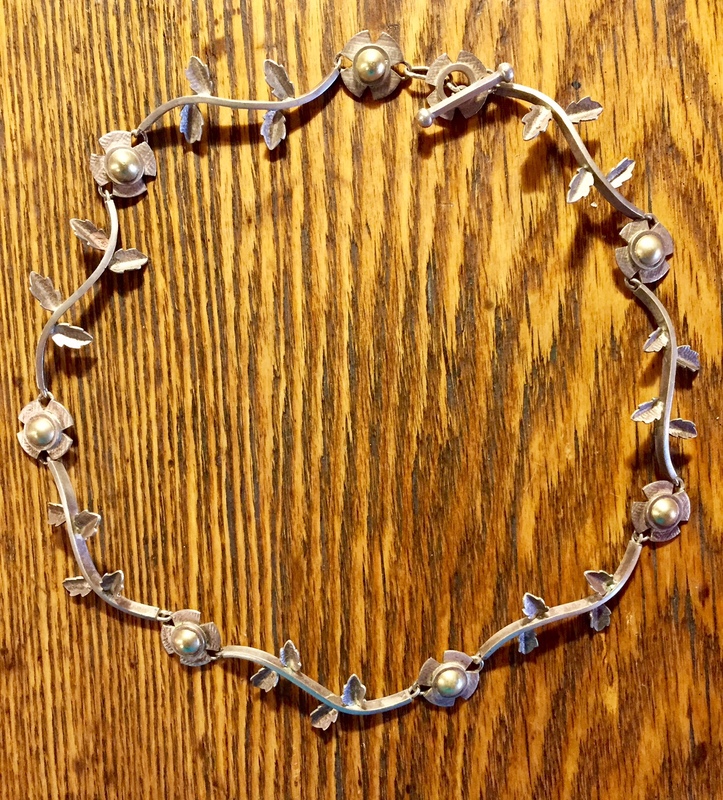 6mm (approx) pearls set in 1/2″ diameter bezel, 1-1/2″ long, mesh silver ball topped with 18K gold crown. Bought at Saks 5th Avenue, 1990’s. Vintage. $165. plus shipping. No signs of wear. #2. SOLD. 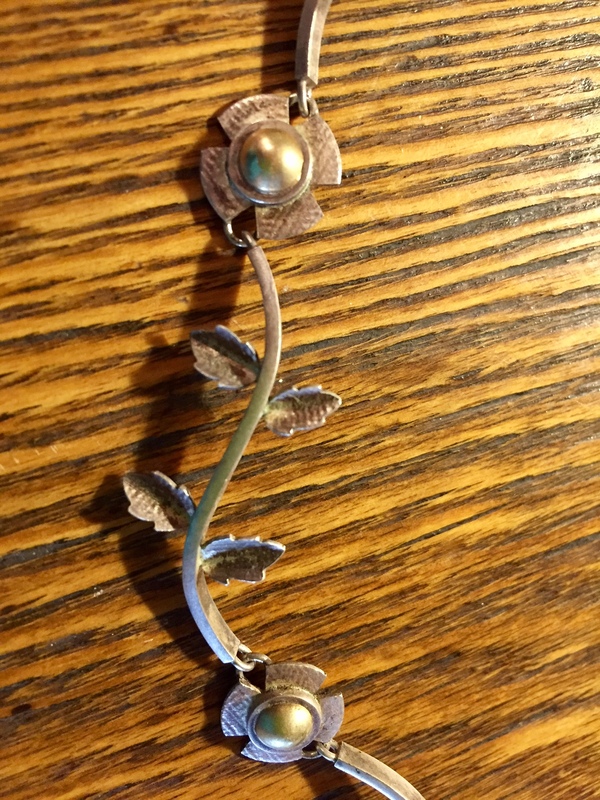 Artisan-designed and hand-made sterling silver leaf and flower necklace 16″ long including clasp. Flowers have 14K gold centers. Bought at Smithsonian Crafts Show, Washington, D.C. $165. plus shipping. #3. 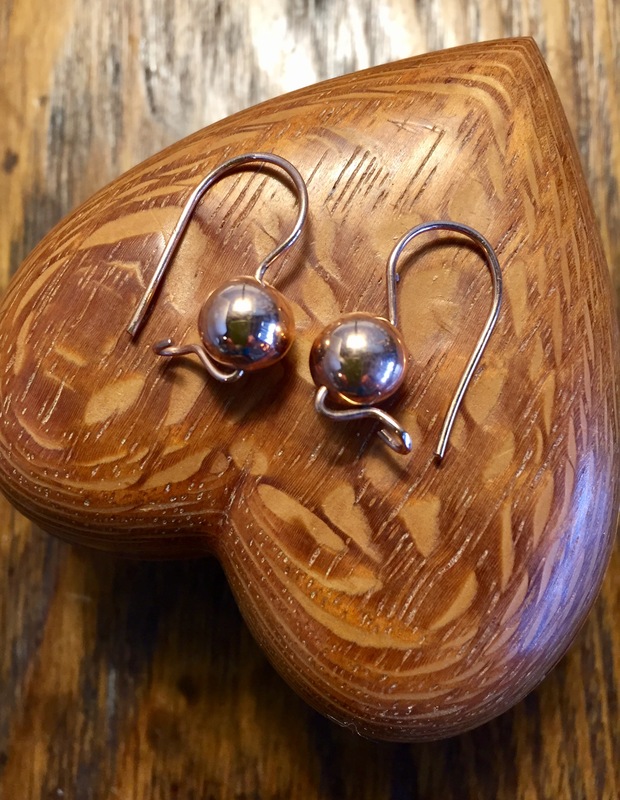 Contemporary Asheville, North Carolina jewelry artist Joanna Gollberg designed and made. 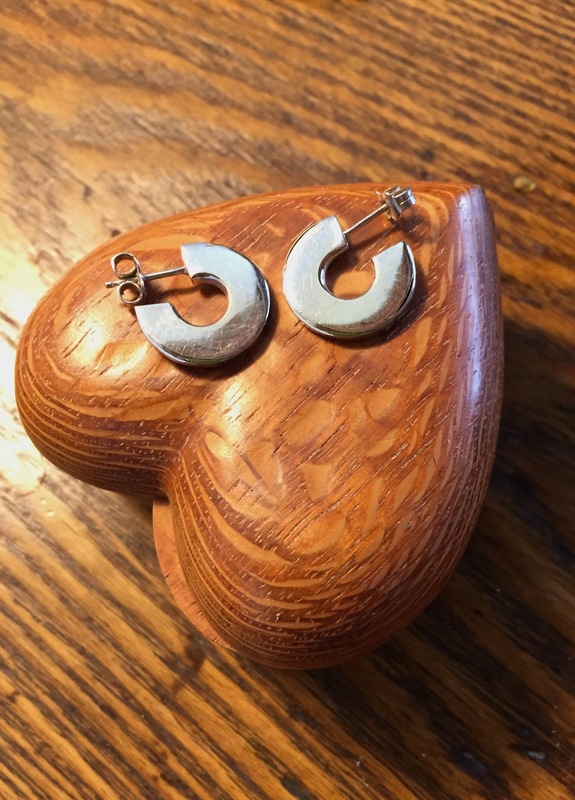 I purchased these from her at the North Carolina Designer Crafts Show in 2003. Hand wrought sterling silver Ellipse (3a. left) and Stix (3b. 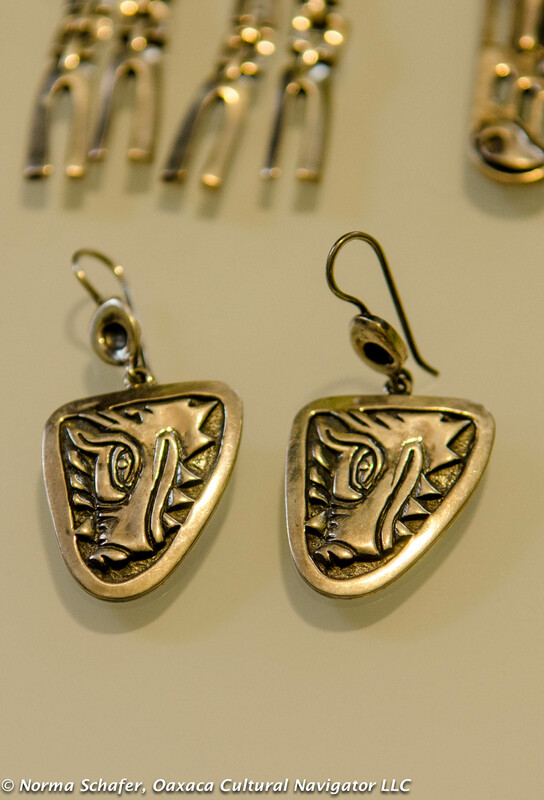 right) earrings. $35. each pair. Plus shipping. #4. I Don’t Remember Earrings. They are either platinum or white gold. Simple, functional. 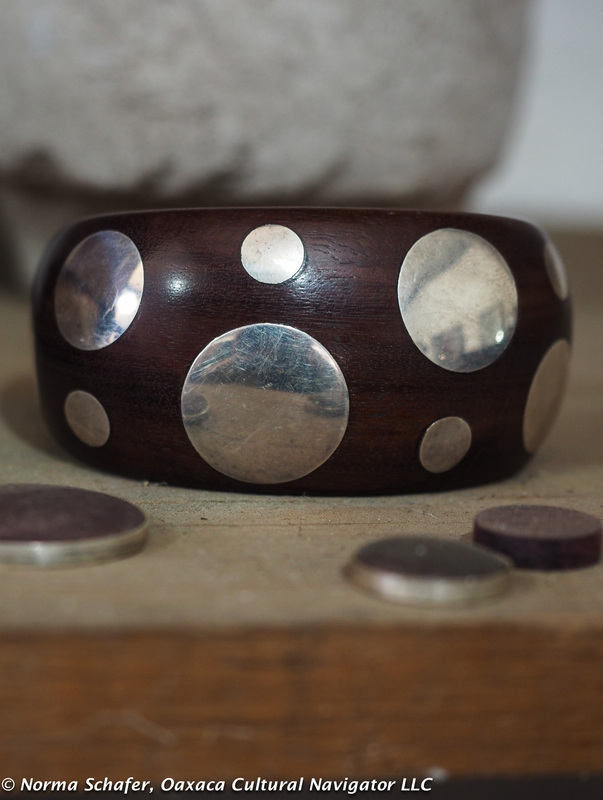 5/8″ diameter. $85. plus shipping. #5. 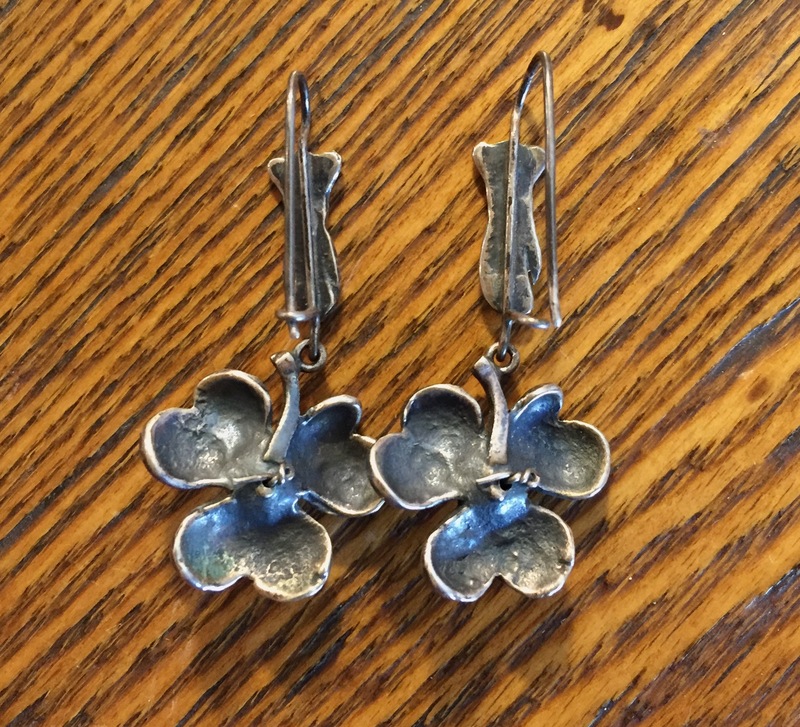 Vintage Thailand Silver Fish Earrings, handmade. 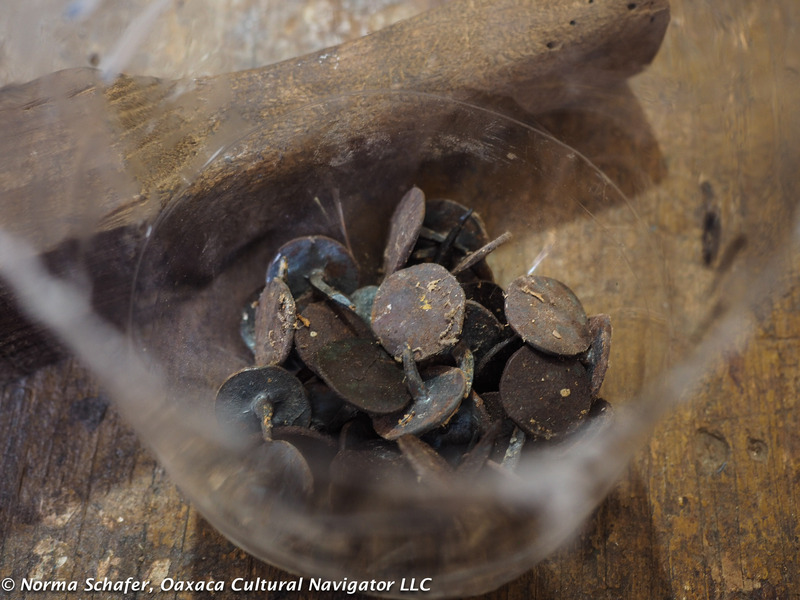 Bought in a Hill Tribe Village outside of Chang Mai, 1994. Old then. 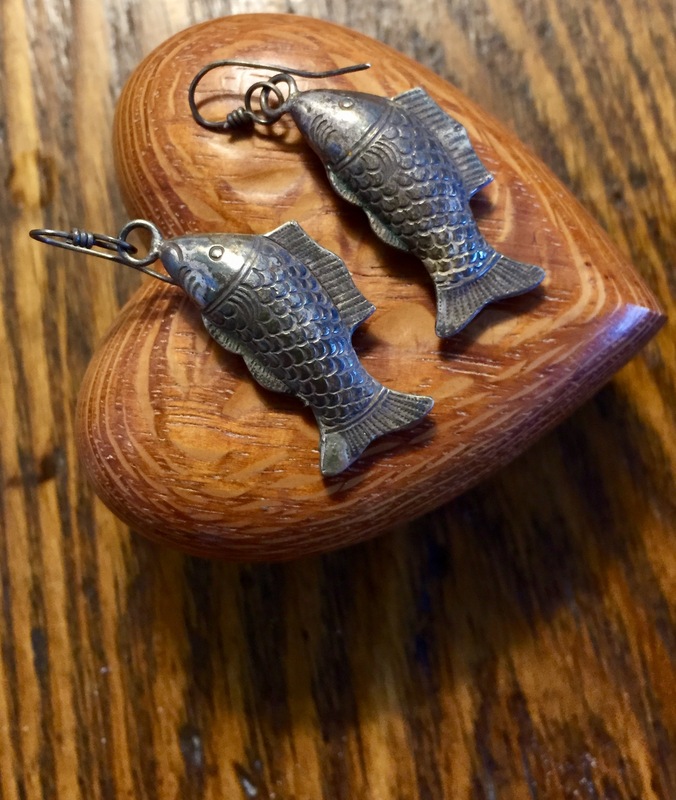 Fish dangles 1-1/2″ from hook eye. I have not polished these. $125. plus shipping. #6. 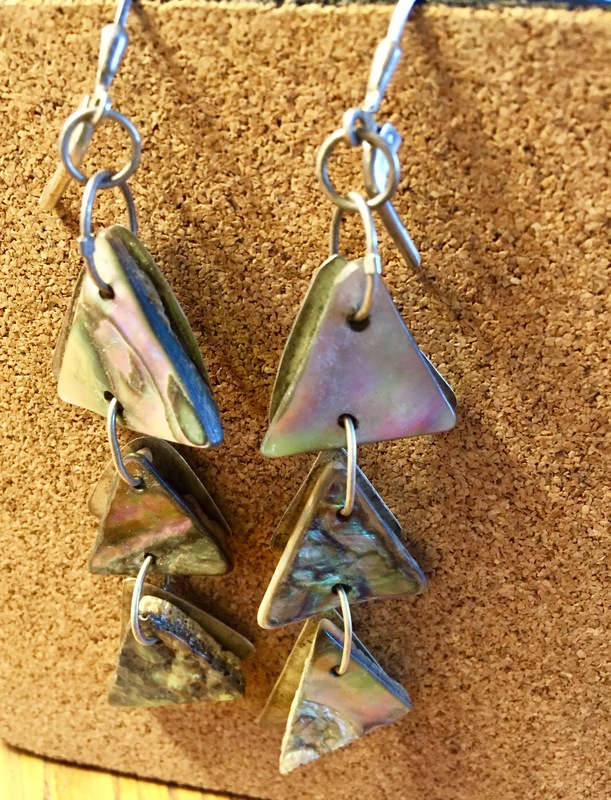 Abalone shell and silver triangle tiered earrings made by Chapel Hill, North Carolina, jewelry artist Rebecca Laughlin McNeigher. Shimmering abalone shell difficult to come by now. 2-1/2″ long. $95. plus shipping. #7. 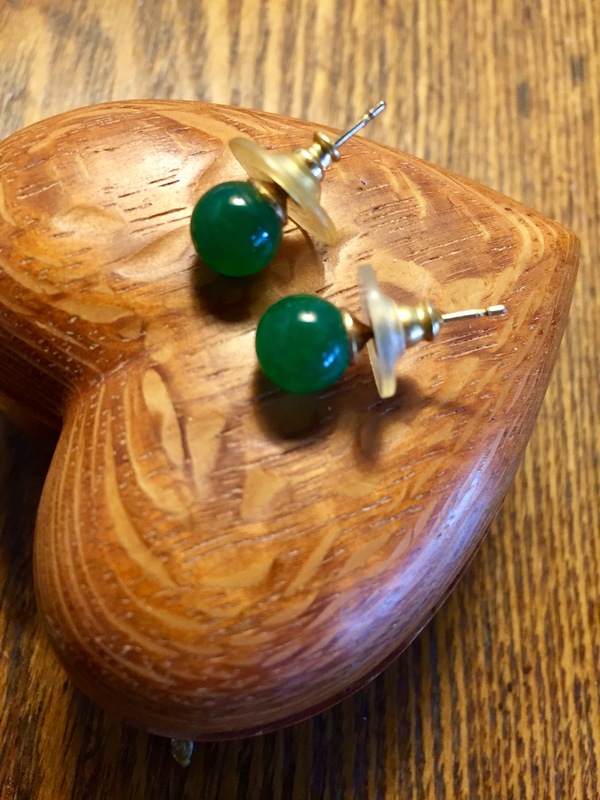 Jade studs, approx. 5 to 6mm, with gold setting and post. $65. plus shipping. #8. 14K Rose Gold ball earrings bought in Australia, 2002. 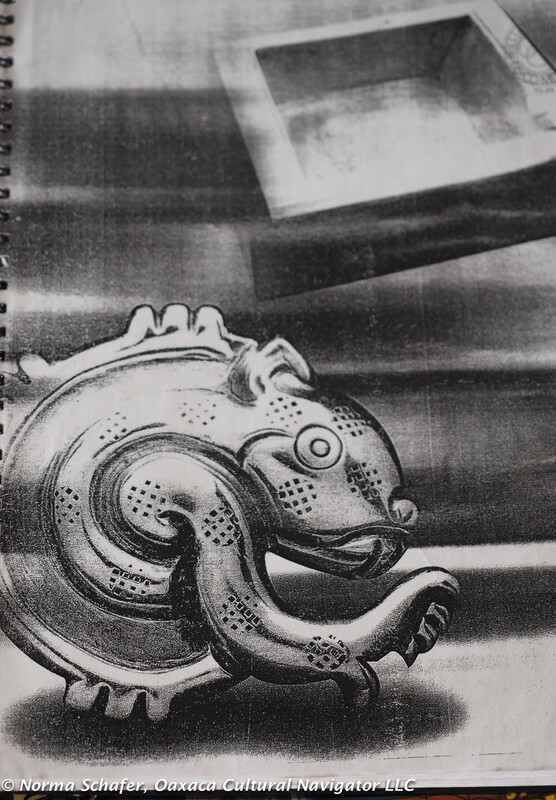 1″ long from curve of hook. Approx. 1/4″ dia. ball. $65. plus shipping. #9. 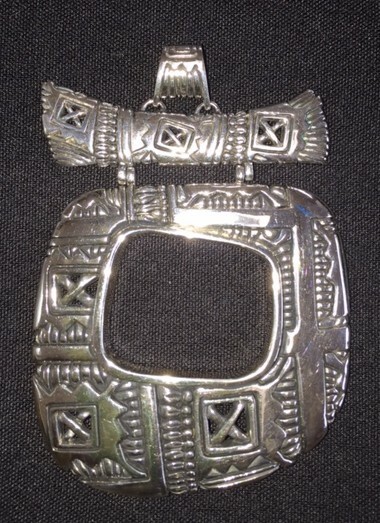 Rare spiny oyster pendant from South America with hand-made sterling silver setting/bale. 1-1/4″ long by 3/4″ wide at bottom. $65. plus shipping. 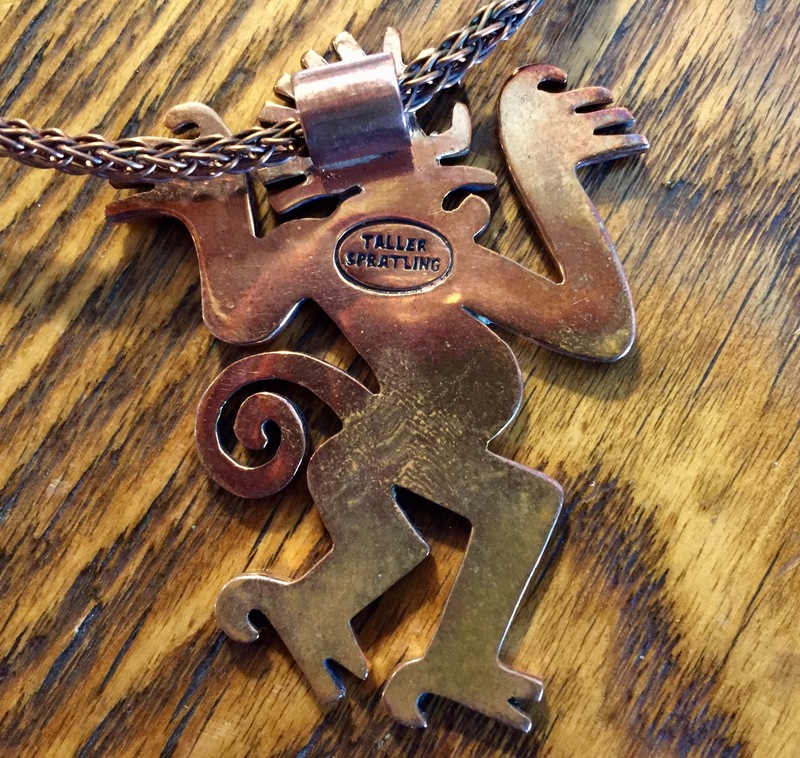 I’m back in North Carolina for a while and it’s time to go through my collection of Mexican folk art, jewelry and contemporary American art pieces. I’m beginning to consider what I no longer use or wear and offer them for sale to you. I’ll be listing an eclectic mix of pieces over the next weeks. Keep your eyes open! They are one-of-a-kind! 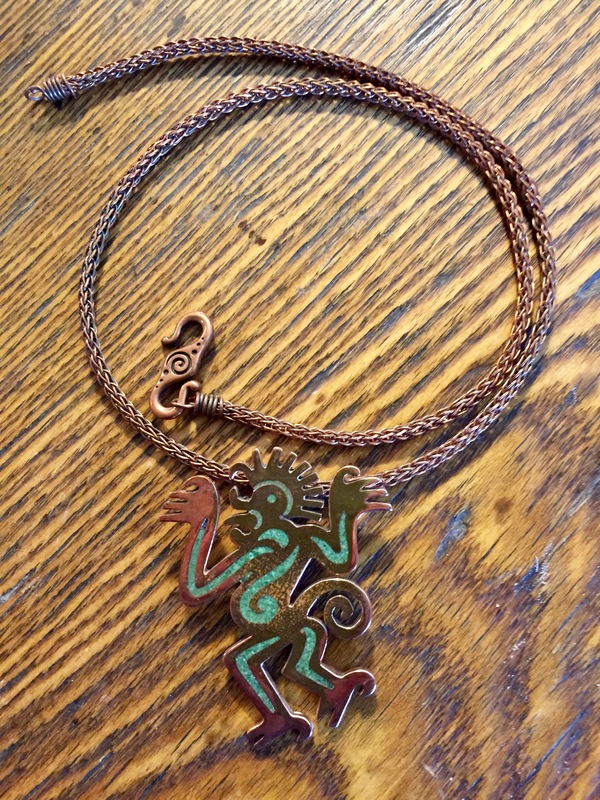 Taller Spratling Monkey (Taxco, Mexico) Copper Pendant inlaid with turquoise, with hand-woven copper chain made by a North Carolina artisan. 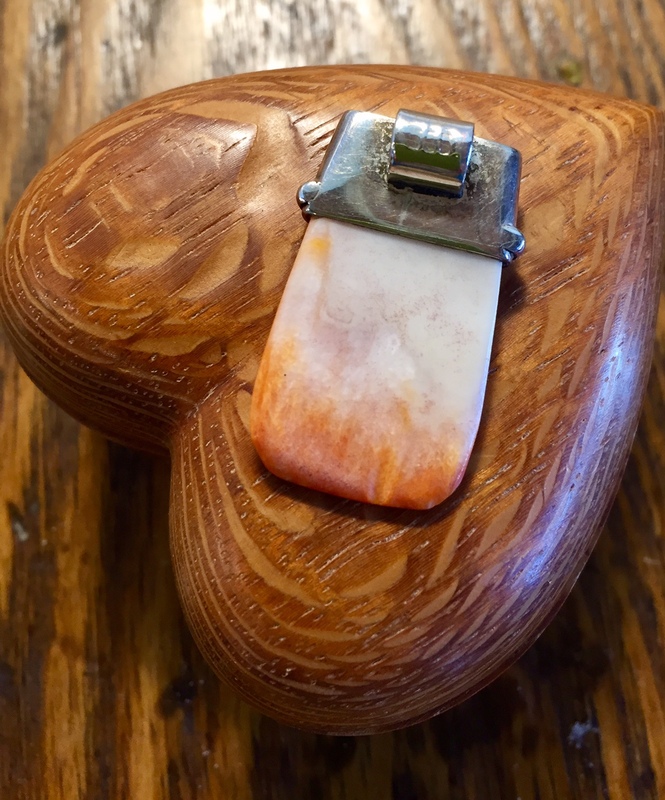 Pendant is 2-1/4″ long by 1-3/4″ wide. 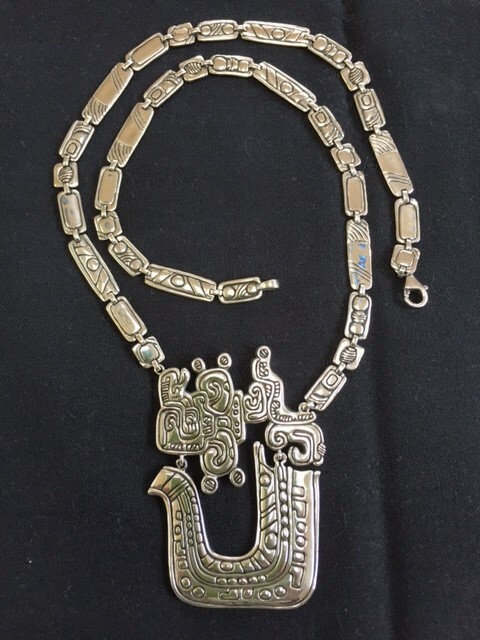 Chain is 20″ long. Newer piece. Priced at $145 for both, plus shipping USPS. 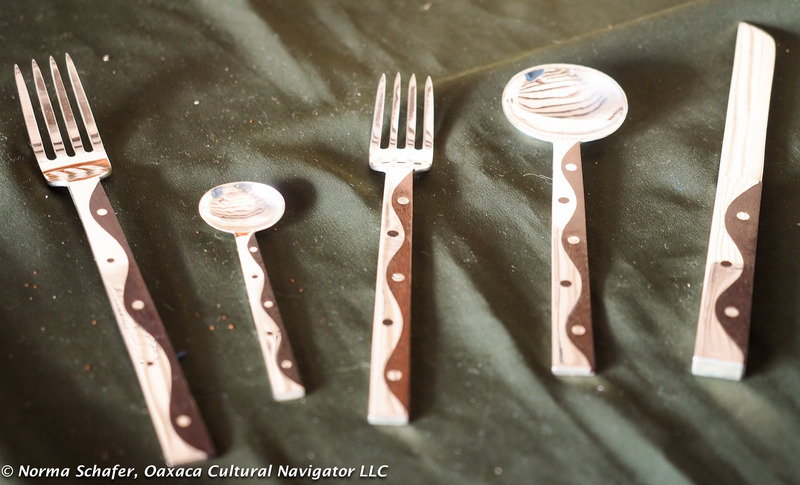 William Spratling inspired the Taxco silversmith industry. 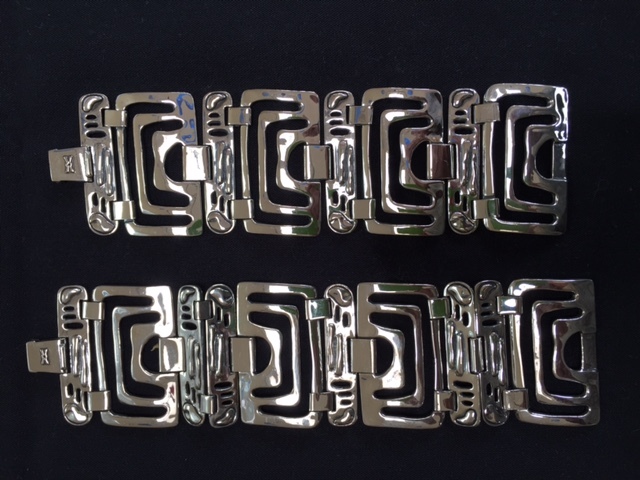 He researched iconic pre-Hispanic Mexican designs, of which this is one. This is a newer piece with the stamp of the current owners who use the original molds. Shows some wear. Needs polishing. 2. SOLD. 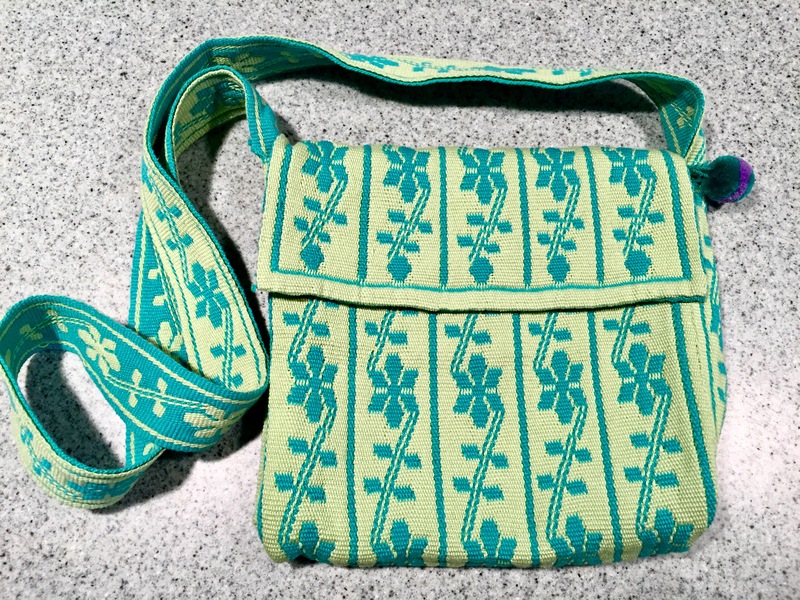 Huichol Lime and Turquoise Hand-Woven Cotton Shoulder Bag. This is a double-faced weave, which means you can turn the bag inside out and it becomes reversible. The bag is 9″x 9″ (approx. ), with a 1-1/2″ gusset that continues into a 44″ long strap. 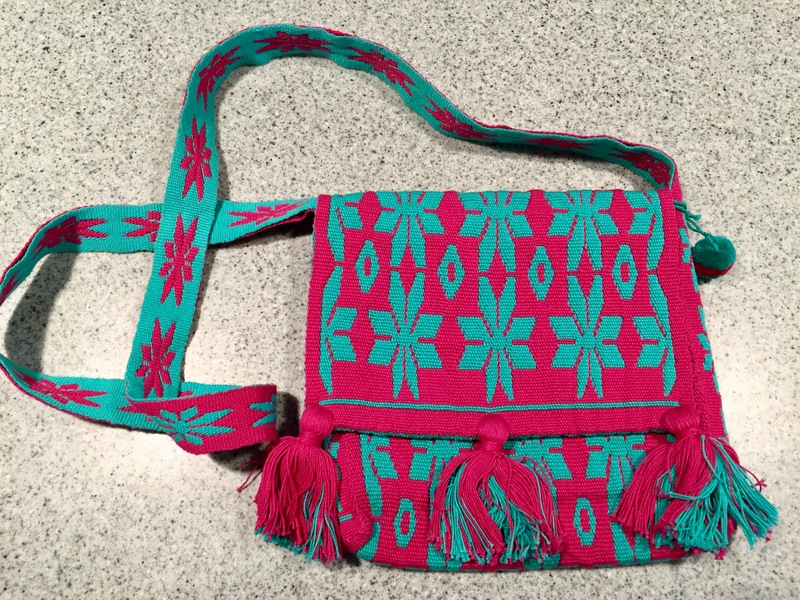 Bag is woven on back-strap loom by Jalisco Huichol women. $85 plus shipping. 3. 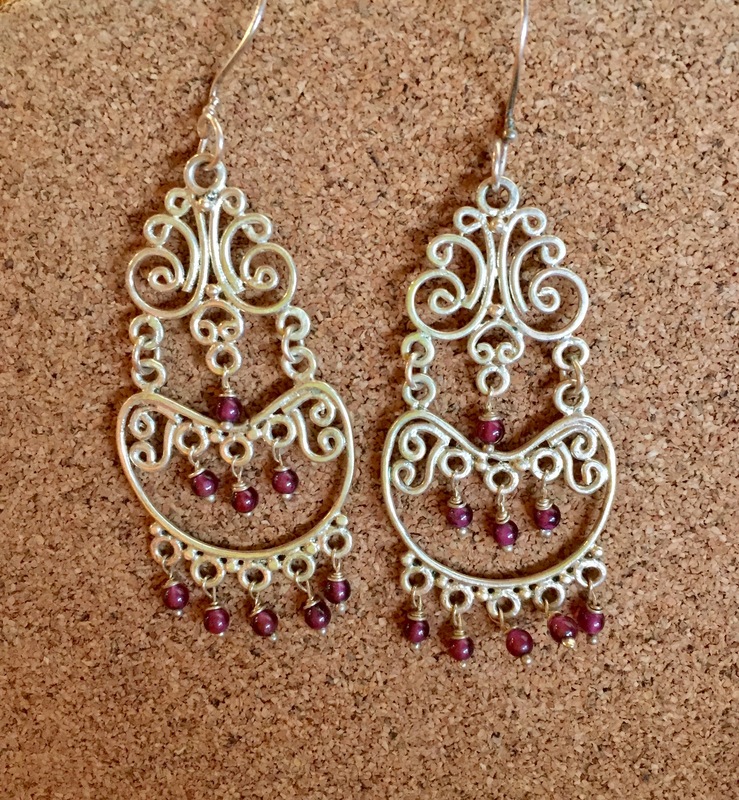 A la Frida Kahlo, Handmade Sterling Silver Filigree Earrings with Garnets from Patzcuaro, Michoacan. 2″ long and 7/8″ wide. Length measured from where hook affixes to earring. 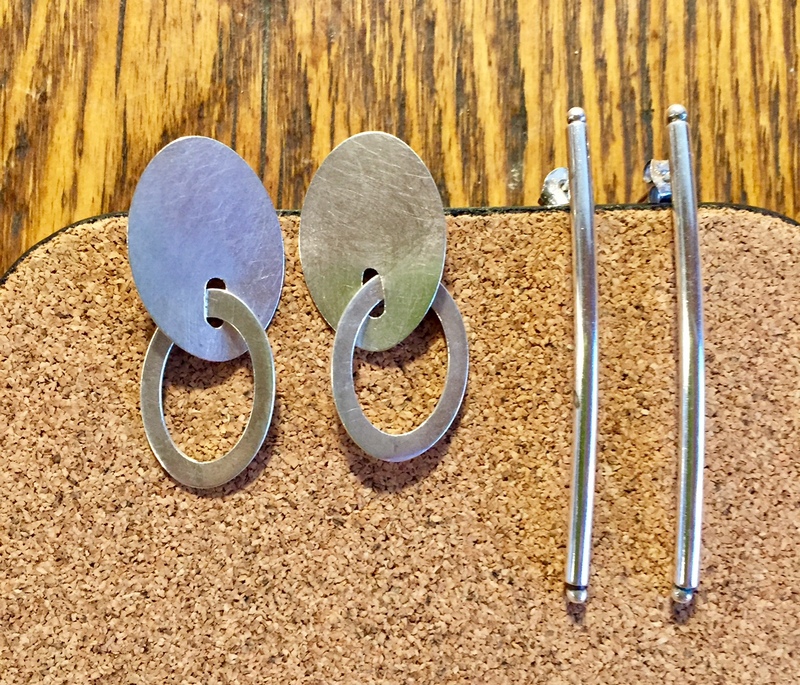 Add length for hook into earlobe. $95 plus postage. 4. Designer Jay Strongwater freshwater pearl, glass beads, sterling necklace, 16-1/2″ long, and Majorica 10mm black pearl studs, from Saks Fifth Avenue. Sold together. $185.00 plus mailing. 5. 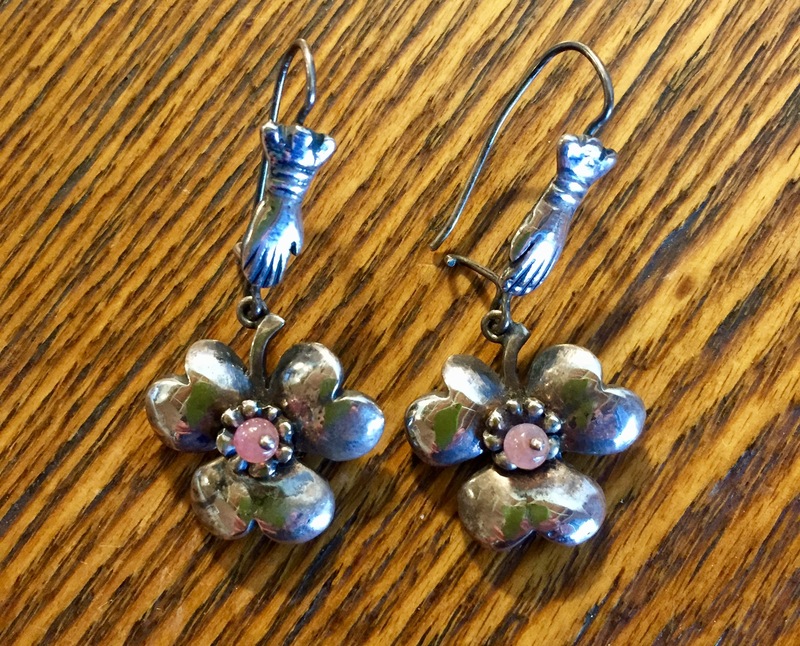 Frida Style Handmade Sterling Silver Earrings, hands with drop flowers, rose quartz centers, from top Oaxaca jewelry shop purchased over 10 years ago. They don’t make them like this any more. 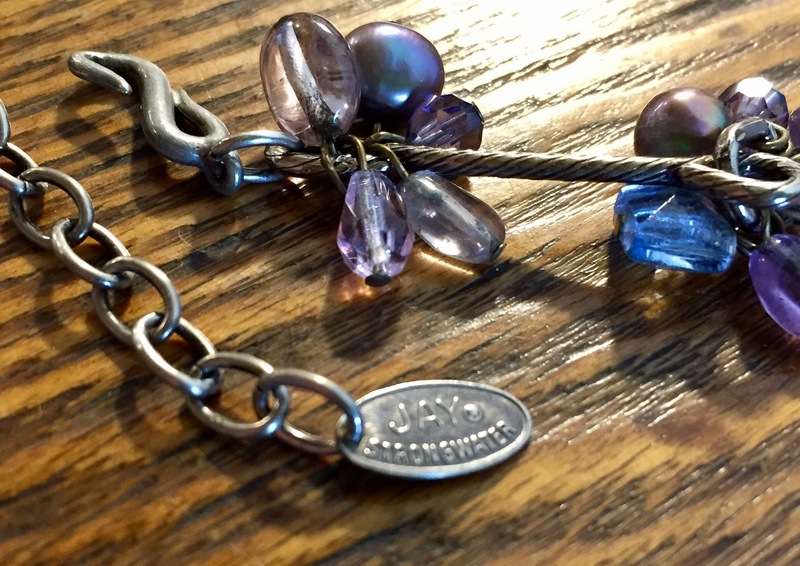 Size 1-1/2″ long from where hook meets hand and 3/4″ wide. $158.00 plus mailing. 6. 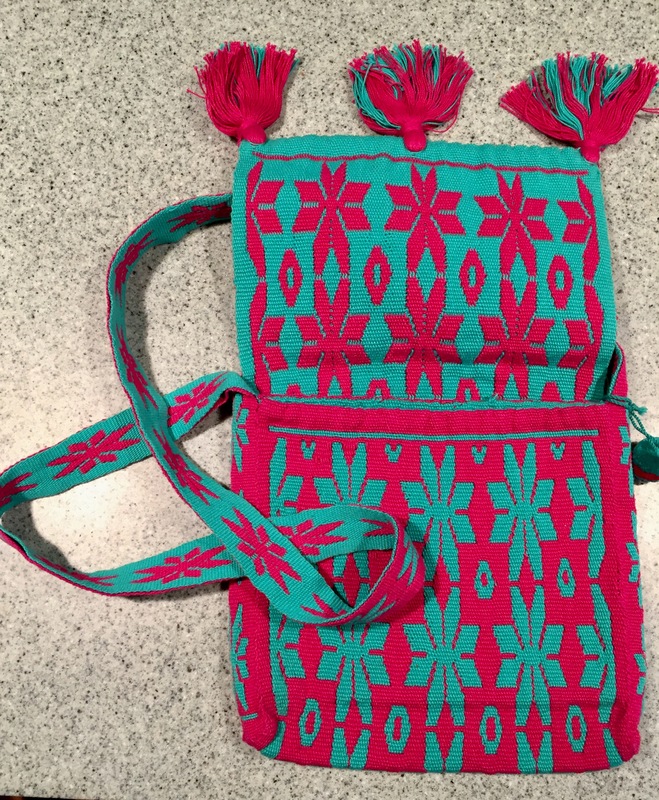 Turquoise and Red Huichol Shoulder Bag, handwoven in Jalisco, Mexico, double-faced on a back strap loom. 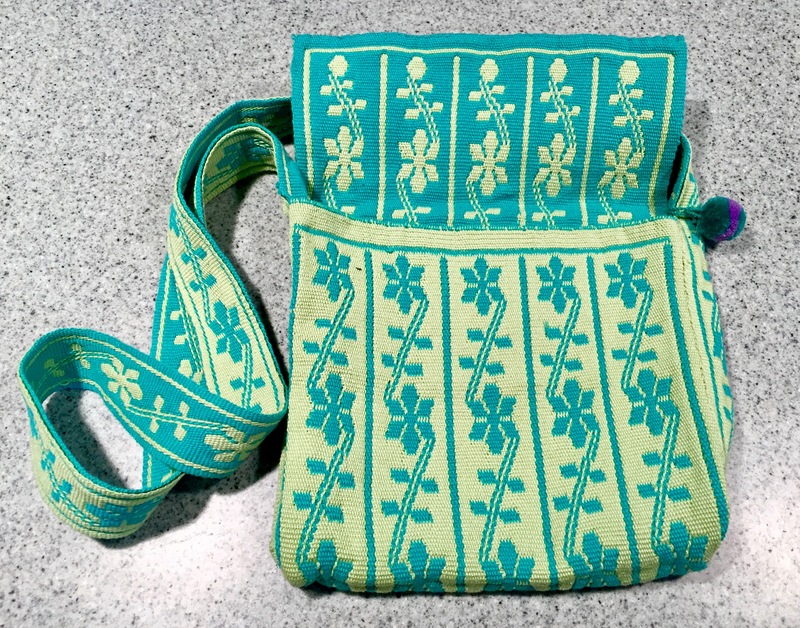 Bag body measures 8″ x 8″. Gusset and strap are 1-1/8″ wide. Strap is 42″ long from where it meets the body of the bag. Turn the bag inside out and it becomes reversible. Inside pocket and tassels on this one. $98.00 plus mailing. Questions? Send me an email. Want to buy, send me an email with the number of the item, date of this blog post, plus your mailing address. I will send you an invoice that includes mailing costs. William Spratling died in 1967 but his legacy lives on through the efforts of Violante Ulrich and her sister Consuelo. 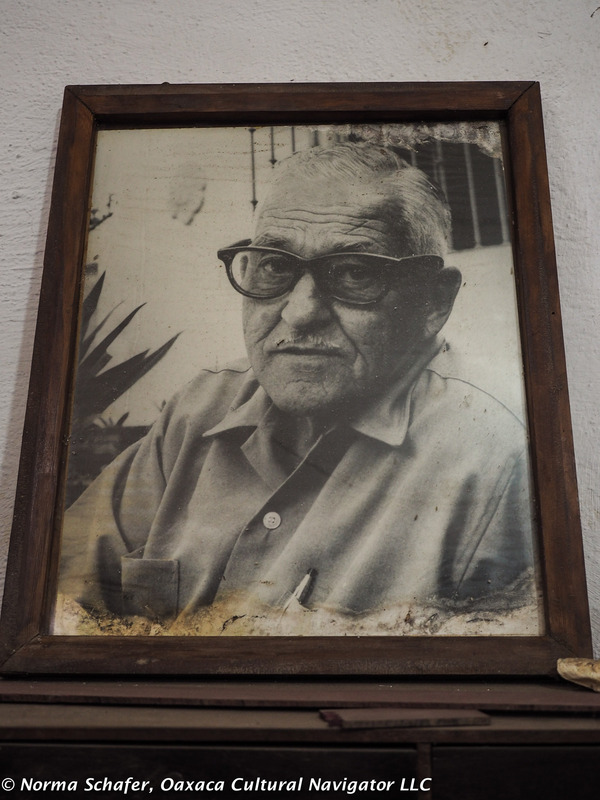 Their father, Alberto Ulrich, was a close Spratling friend and supporter. 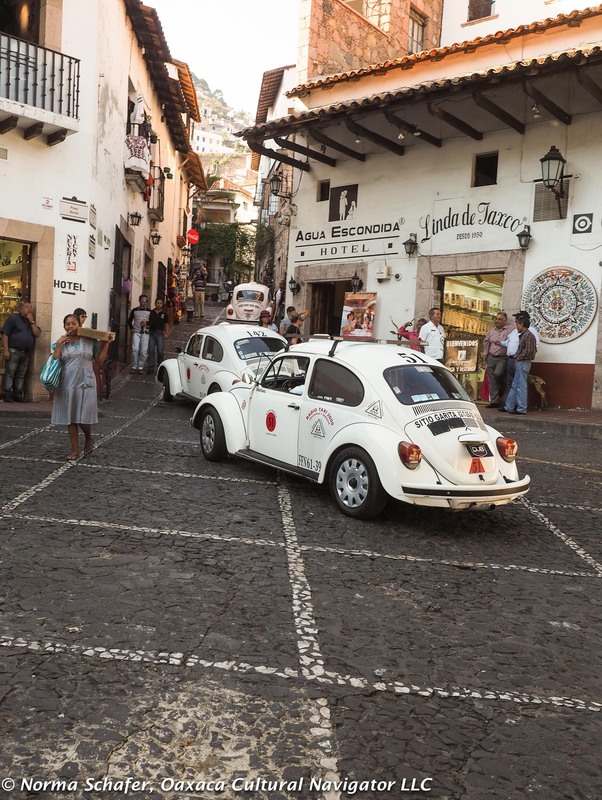 They drove race cars together along the narrow winding roads connecting Taxco with the Pacific beach resort of Acapulco. Ulrich took over the Spratling enterprise then to keep it going and his daughters are also committed to this. 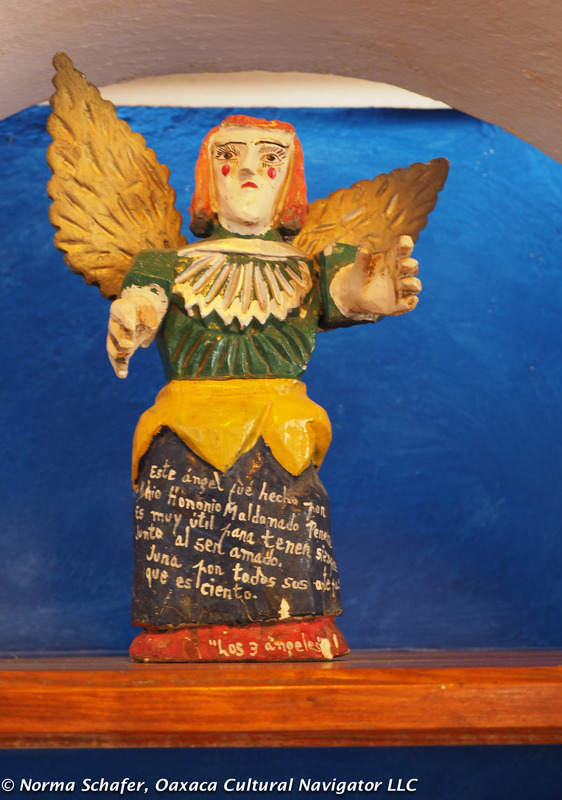 I made arrangements with Violante to spend a day with her in Taxco during our recent folk art study tour. 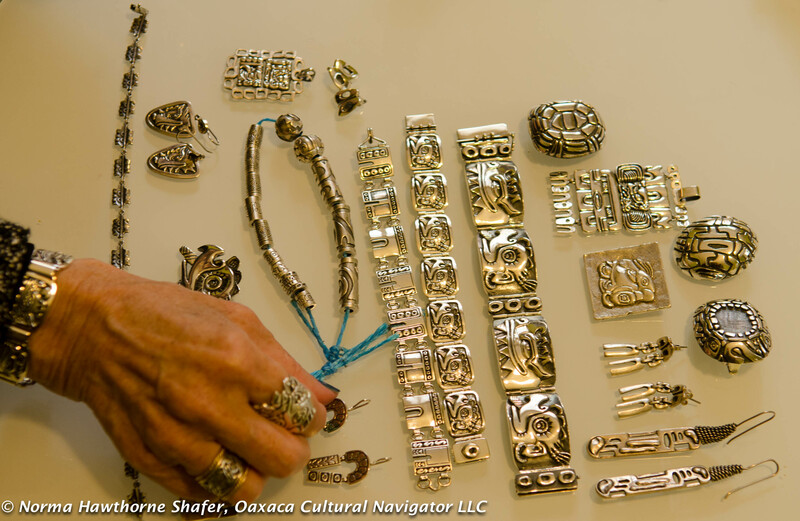 Silver is to Mexico what rebozos are, too. Part of this country’s cultural identity. 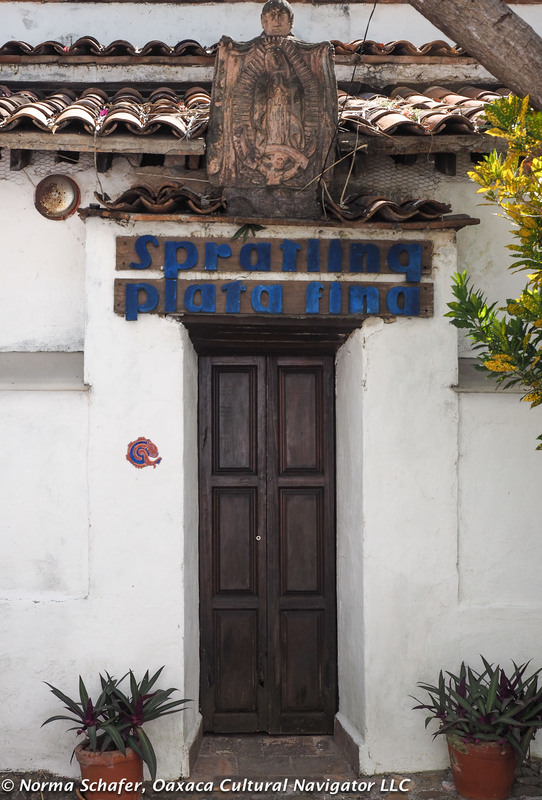 So, seeing the Spratling home Las Delicias where he first lived and worked was an essential part of this experience. 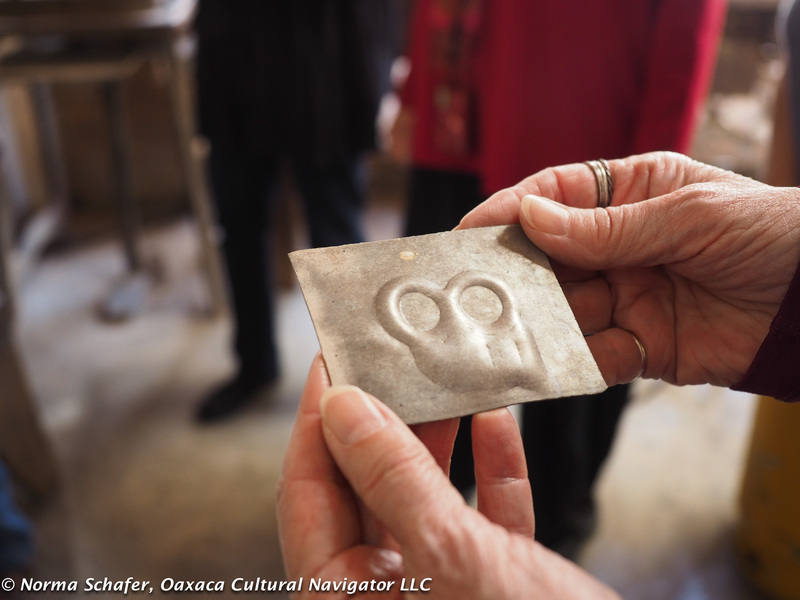 I remember visiting the Spratling silver galleries in Taxco in the early 1970’s. I was young and couldn’t afford much. Even then, Spratling was a legend. There were many beautiful pieces for sale in the showroom on the plaza. 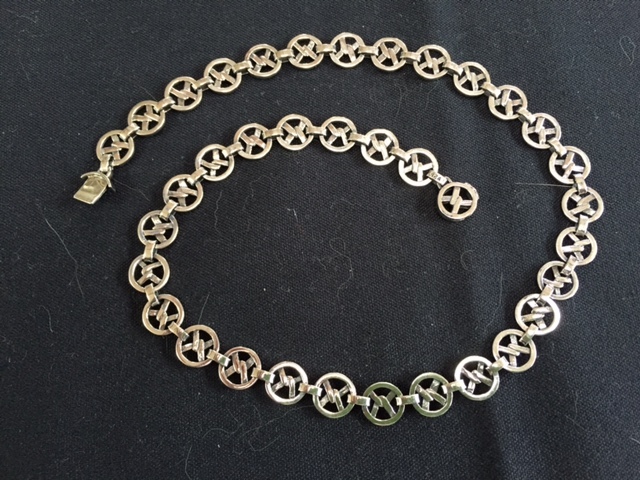 I managed to buy a small chain for $35 USD — a big sum then — and still have it! 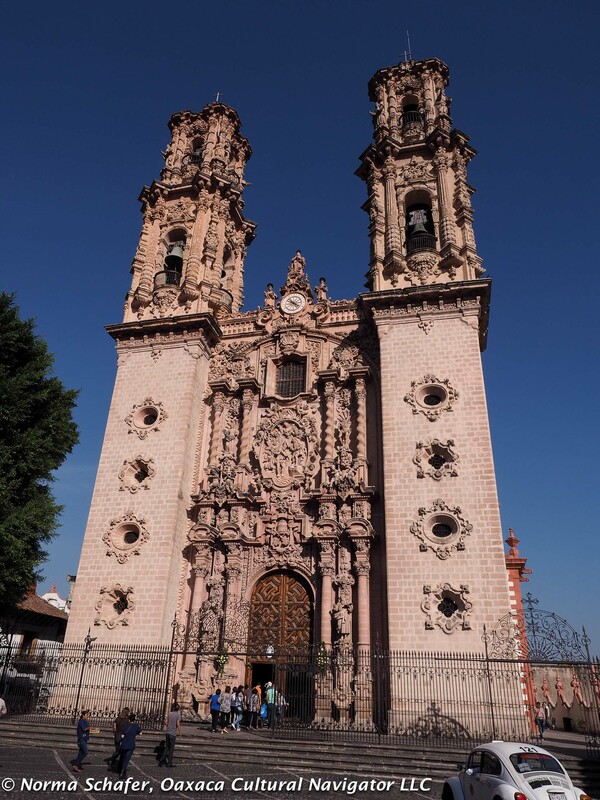 Taxco is about a two-hour drive from Tenancingo, so it made sense to me to schedule this as a day trip. When we arrived, we had breakfast at S’Caffecito prepared by Violante and her staff, got a tour of the house, galleries and and rooftop terrace overlooking the church. Above left, Violante with a Marilyn Monroe chair. Right, the Spratling monkey. 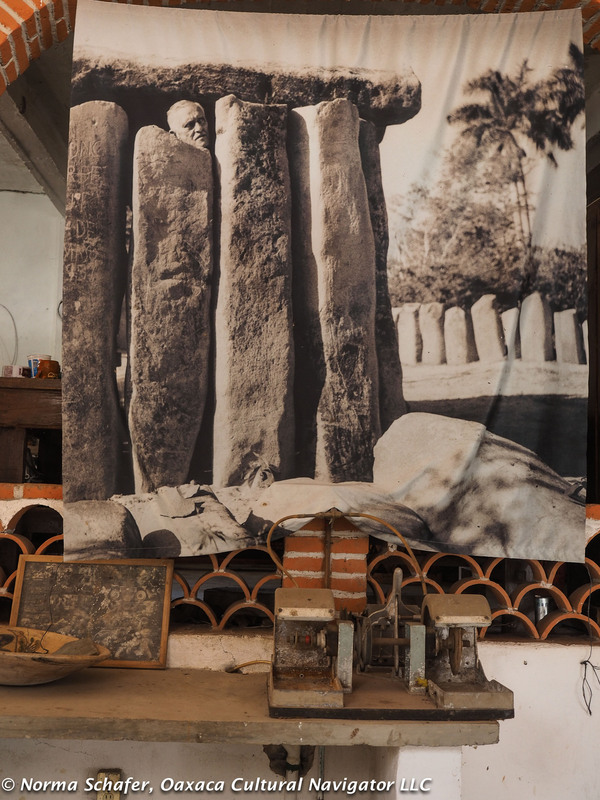 Then, we got in the van and drove to Taxco El Viejo on the road to Iguala, where Spratling later built his ranch. He did this for many reasons. 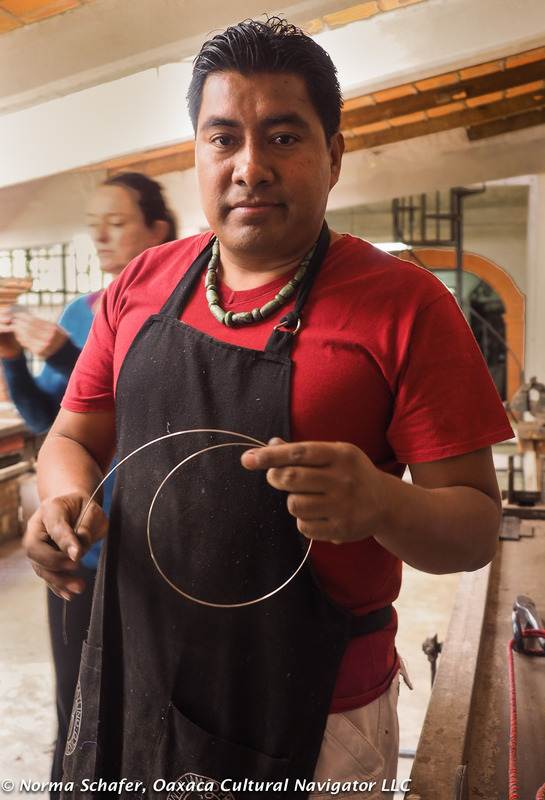 He wanted privacy and a workshop away from the hovering eyes of other Taxco silversmiths who began to copy his work. Spratling workshop, just as it was then. Antonio demonstrates. 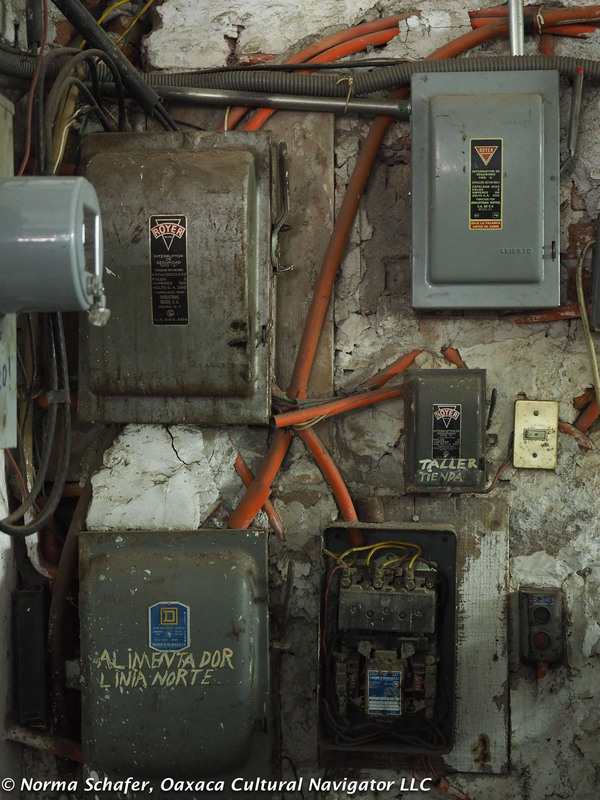 It was amazing to be in this space where all the equipment used now was the same as it was then. 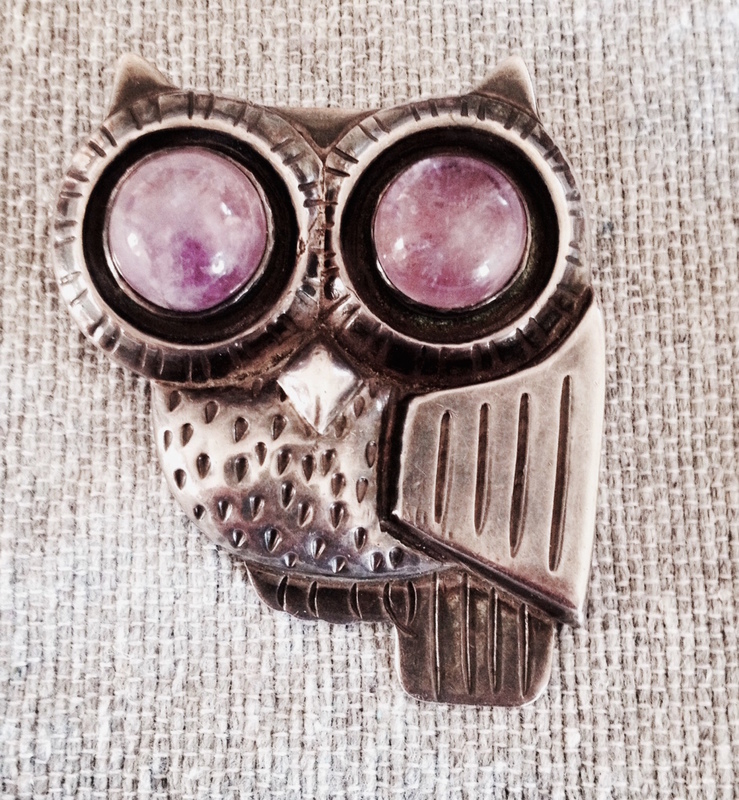 The beginning of the owl pin with the amethyst eyes. 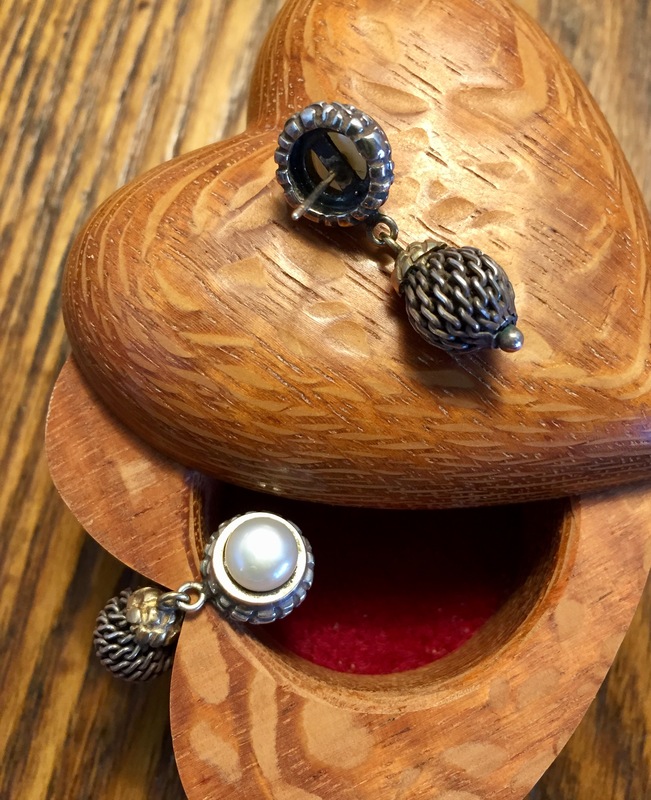 The jewelry molds are exactly as they were, and skilled craftsmen are creating silver flatware inlaid with rosewood, pins, necklaces, bracelets and earrings in the same gauge metal and quality that William Spratling used. 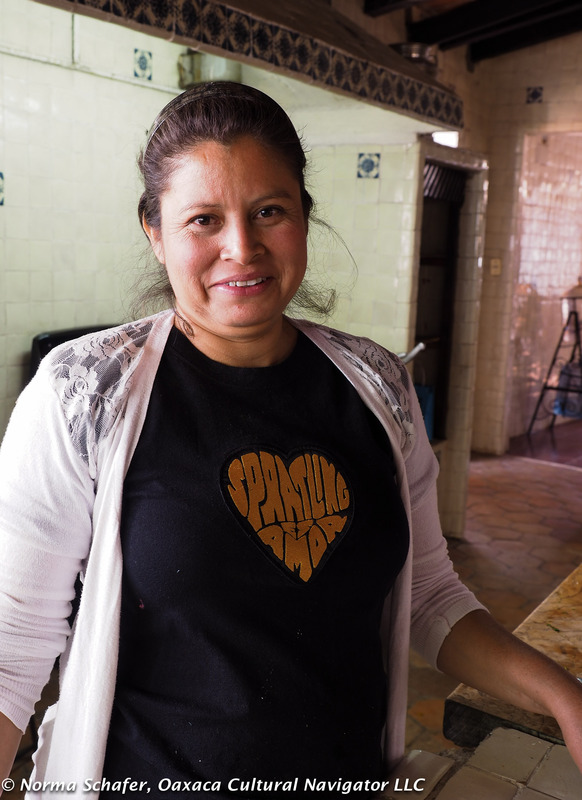 Not much has changed, thankfully, except that the next generation of Spratling silversmiths include Violante and Consuelo who have registered a new stamp with the Mexican government and also design and produce their own work. We saw the chairs that Spratling designed for Marilyn Monroe that went undelivered because of her suicide. How did they know this? 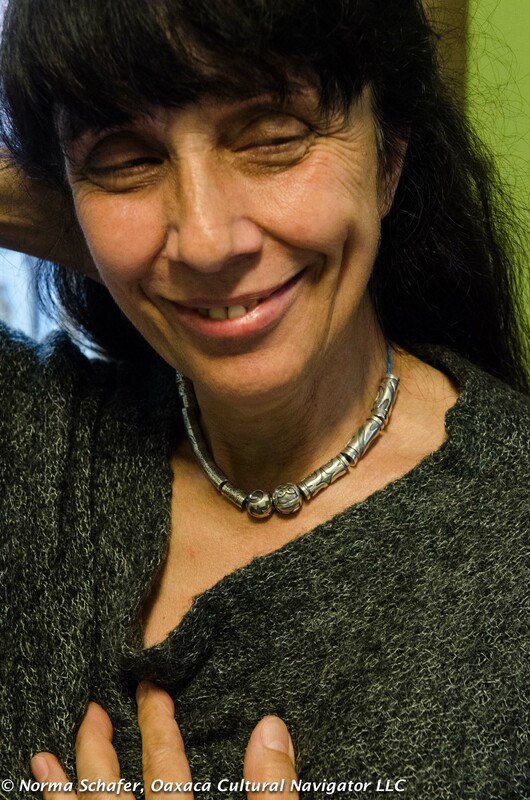 Margarita Gonzales, the accountant, kept impeccable records, and when Alberto Ulrich found the stash of chairs tucked away in a closet, he knew exactly where to look to track the provenance. After a tour of the ranch and the workshops, we settled in for a delicious lunch under the corridor next to the kitchen. We talked about beauty, history, Spratling’s love of red, white and blue ornamentation that represented to him the colors of melting silver. 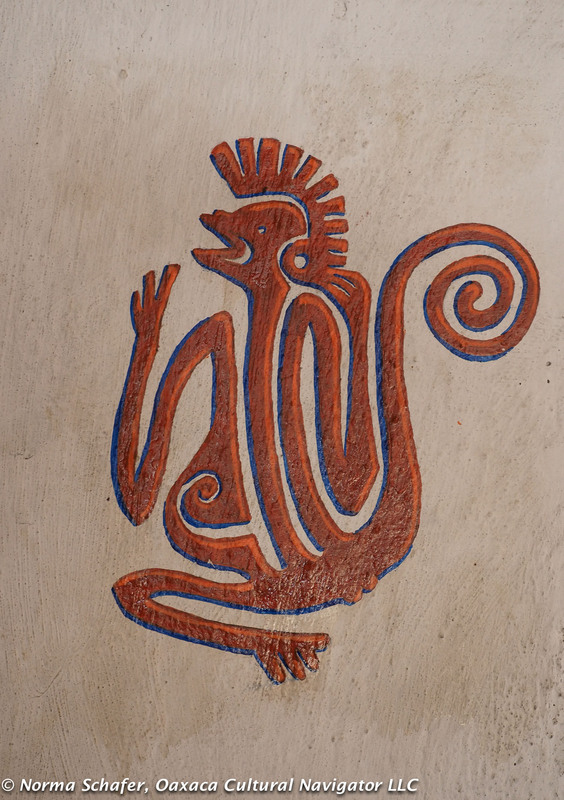 We saw pre-Columbian sculpture and folk art figures from Spratling’s personal collection. 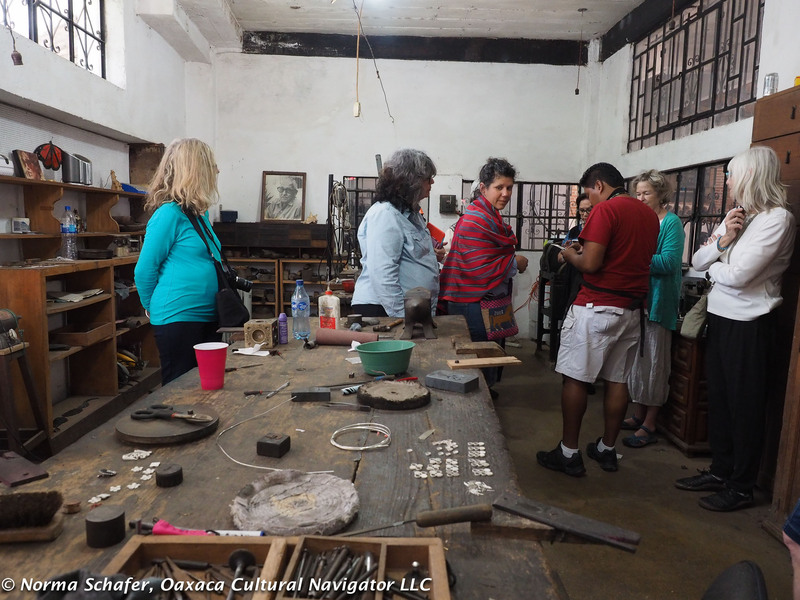 A day with Violante Ulrich is a rich experience by which to understand the lore and history of Taxco silver making and the life of William Spratling. 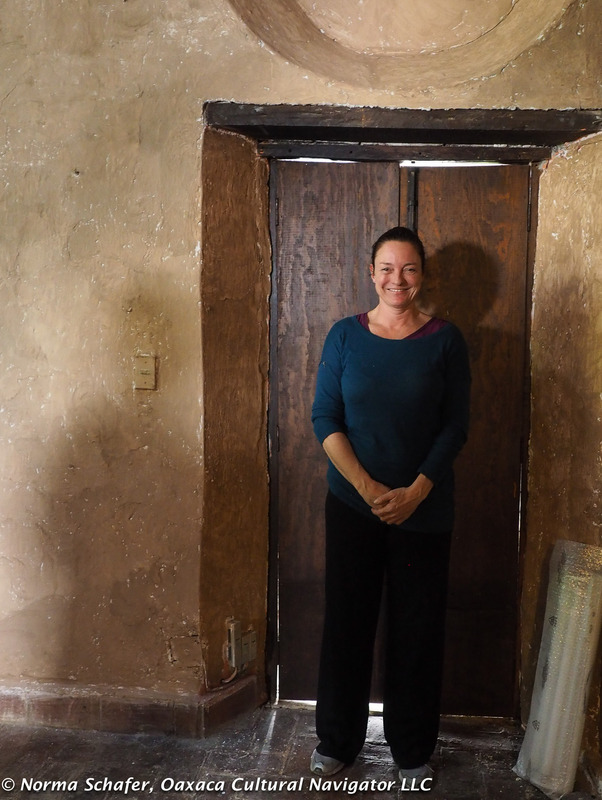 She is an artful cook, outstanding silversmith, great host and dedicated to preserving the ranch which is in need of restoration. We were fortunate to spend this time with her. 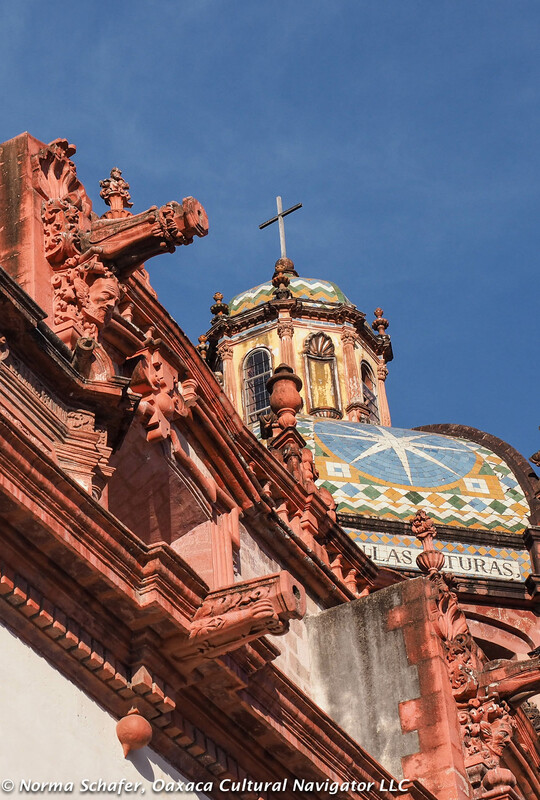 At the end of the afternoon there was enough independent time to explore the steep cobbled hill town, go into the church and search for more silver treasures before heading back to Tenancingo. A surprise awaited us! 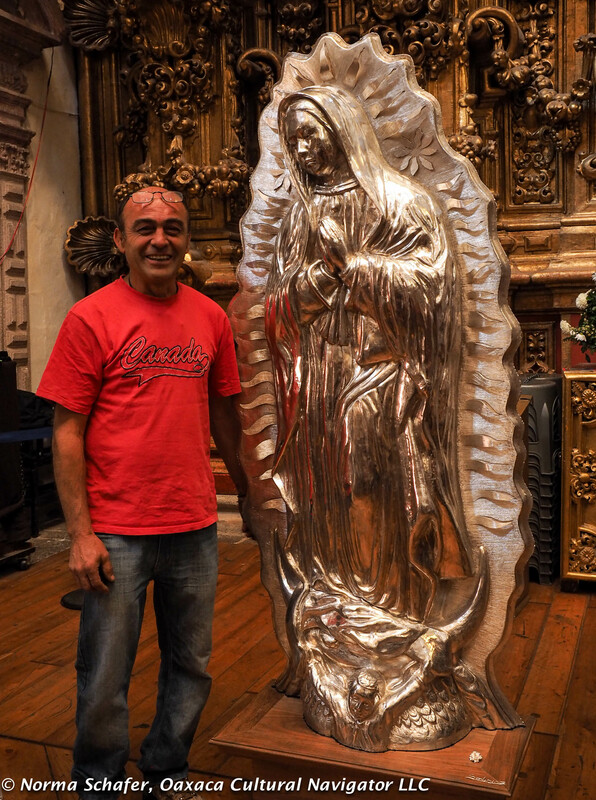 In the church was sculptor Miguel D. Sobrino who created the silver Virgin of Guadalupe that stands beside the altar encased in protective glass. Except today, Our Lady had been removed from her case and was being thoroughly cleaned to prepare her for a move to the Basilica de Guadalupe in Mexico City to greet Pope Francis. 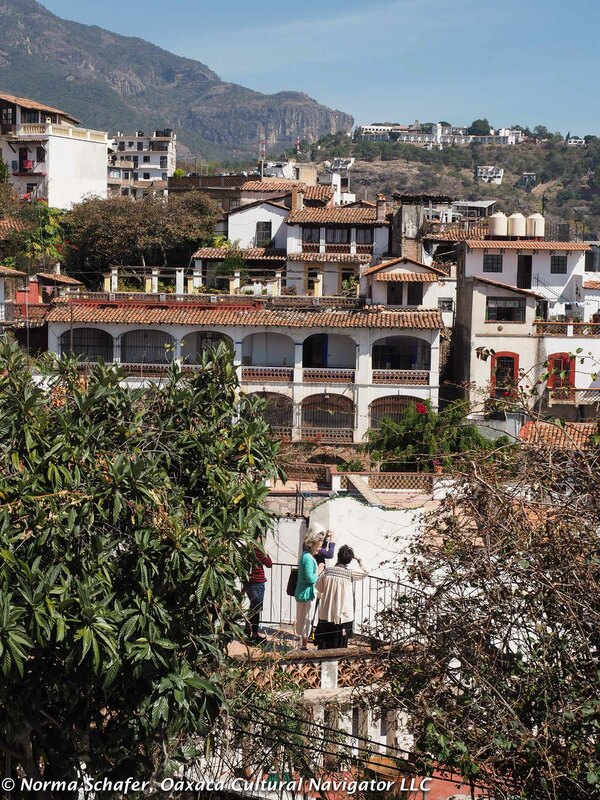 We enjoyed lots of views — from the Las Delicias rooftop garden and the terrace overlooking the central plaza. 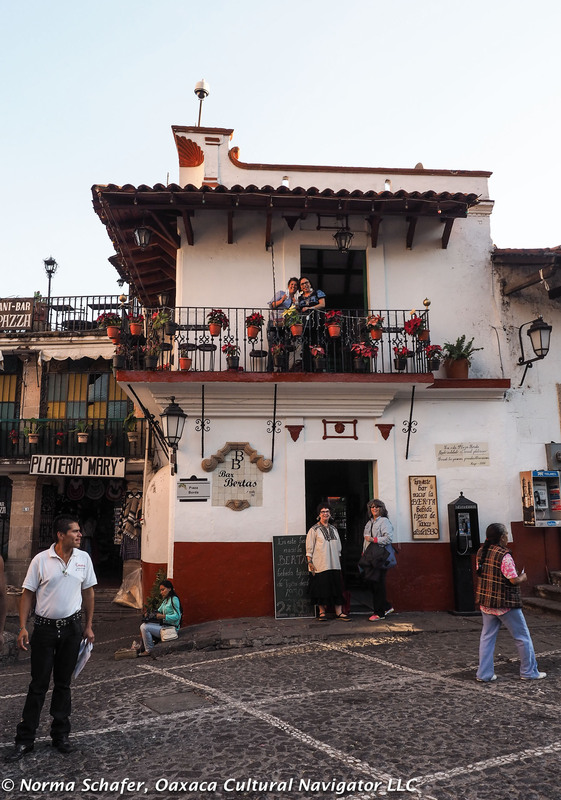 For some on the study tour, this trip to Taxco was a dream come true. I hadn’t been back for 44 years until last September. I’m looking forward to the next time. I hope you can come with me. 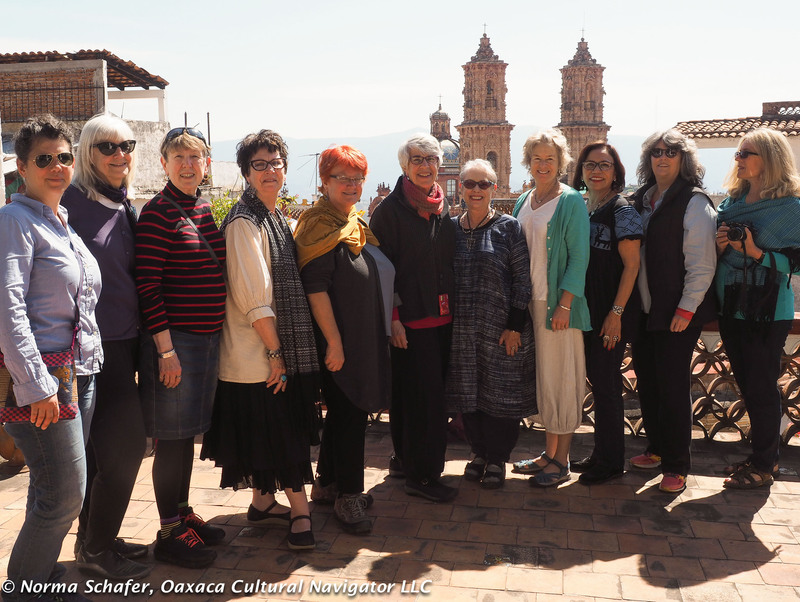 I will be organizing this rebozo study tour for mid-September 2016 to coincide with the Tenancingo rebozo fair. 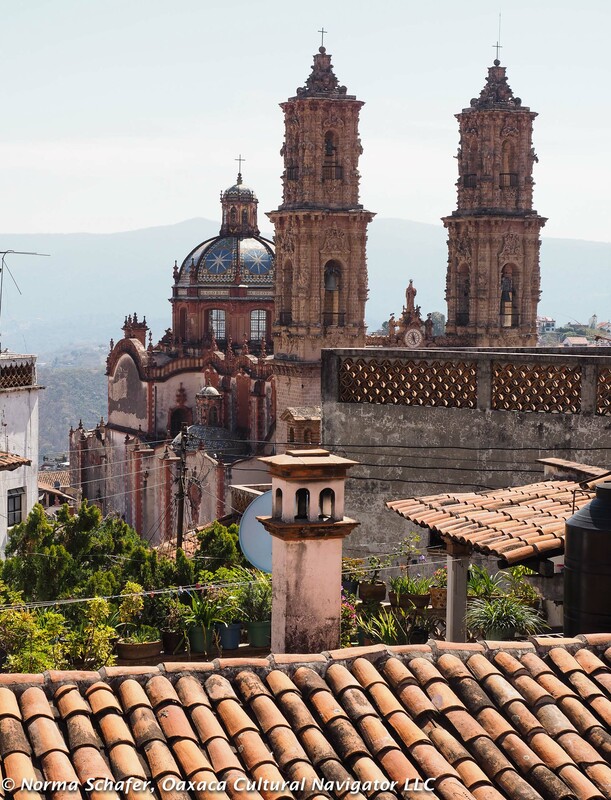 There will be a few modifications in the itinerary we just completed but the trip to Taxco is set in stone! Please tell me if you are interested. Get on the notification list! 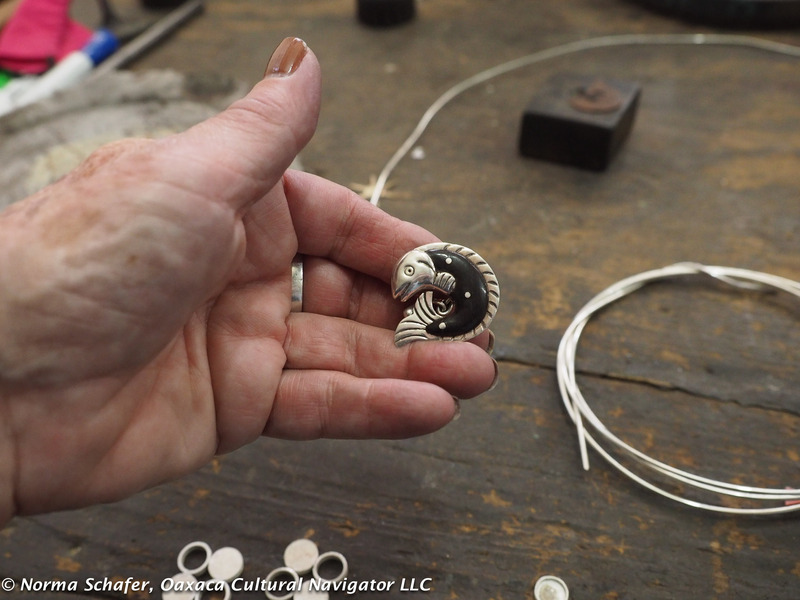 If you want to take a silver jewelry making workshop at the Spratling Ranch, please contact Violante directly. She is also starting a B&B there, so there are some accommodations. The ranch is in need of restoration so please support her efforts in any way you can. It’s an important part of Mexican history. Thank you! 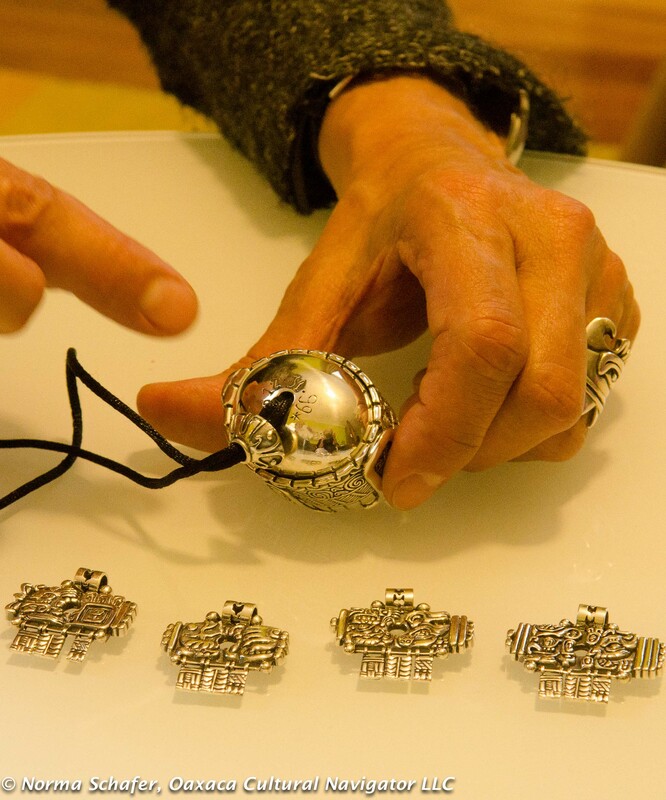 This is a show and sale for 10 pieces of Kandart sterling silver jewelry made in Oaxaca, Mexico, by French silversmith Brigitte Huet and her husband Ivan Campant. 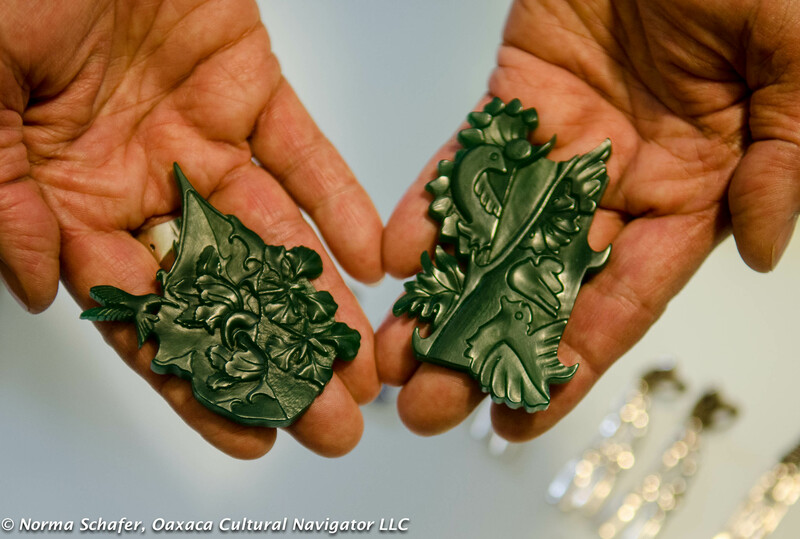 The one-of-a-kind pieces are the last remaining for sale from the Oaxaca collection. 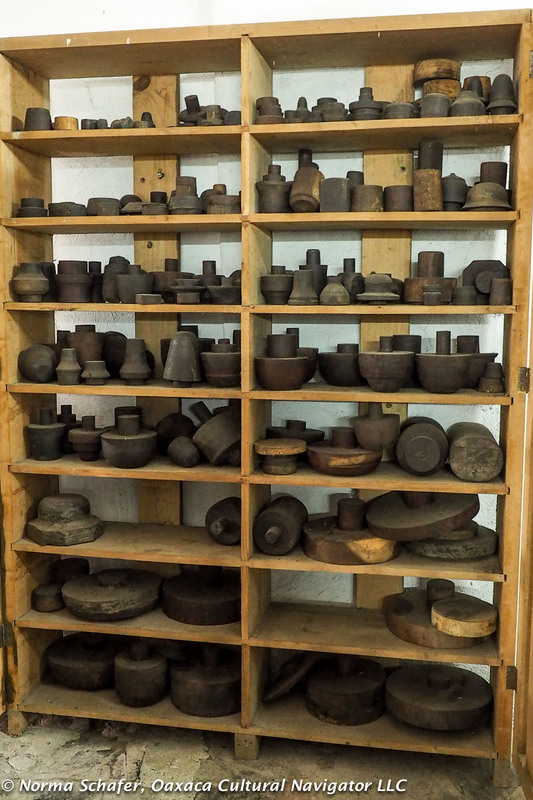 Many of them were made 15 and 20 years ago and put away as keepsakes that Brigitte and Ivan have now decided to sell. 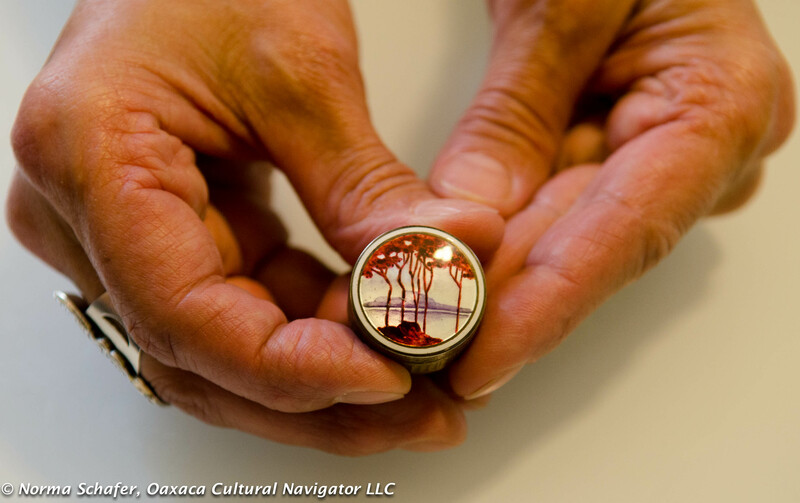 This may be your last opportunity to buy these unique collector pieces. If you want something, please choose quickly, then contact me by email and include your mailing address with ZIP Code. I will send you a PayPal invoice for the piece plus shipping and insurance at the sale value. Brigitte and Ivan thank you and send best wishes. 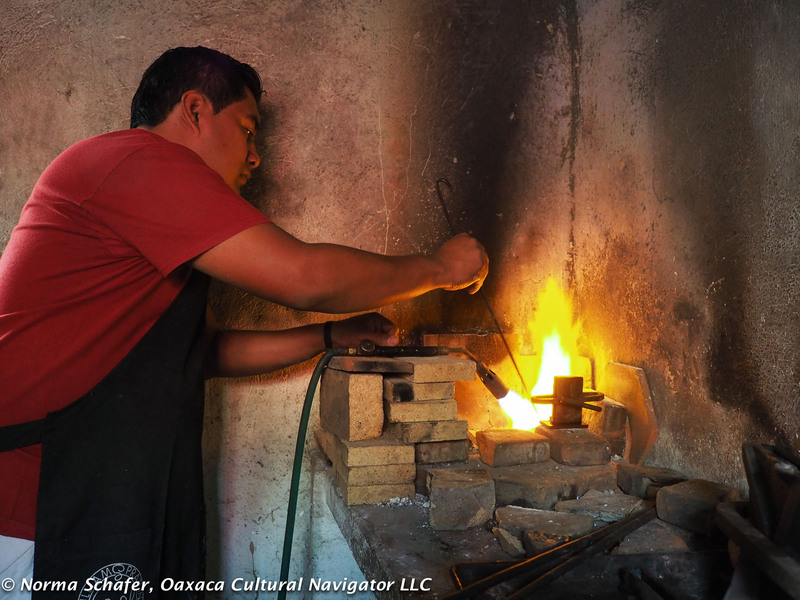 They left Oaxaca in early 2014 to return to southern France. 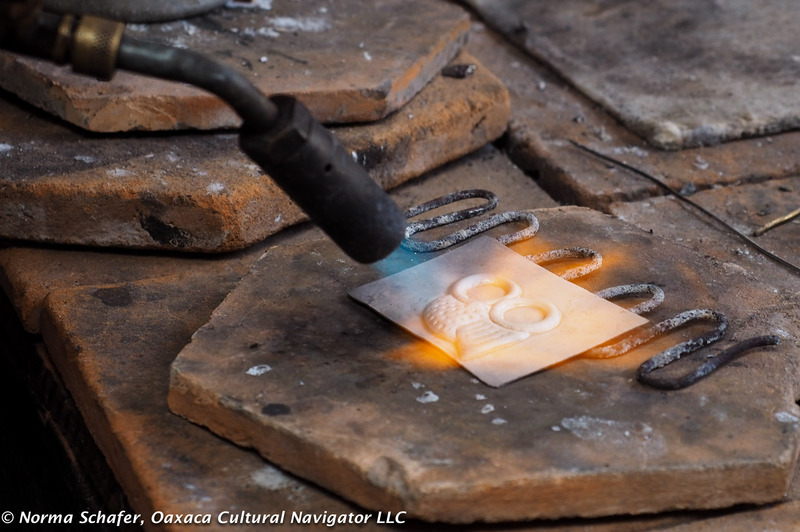 They are living in a small village near Toulouse, creating new wax carved designs that will be made in limited editions with silver casting as soon as they are able to move to a house that will accommodate a working studio. 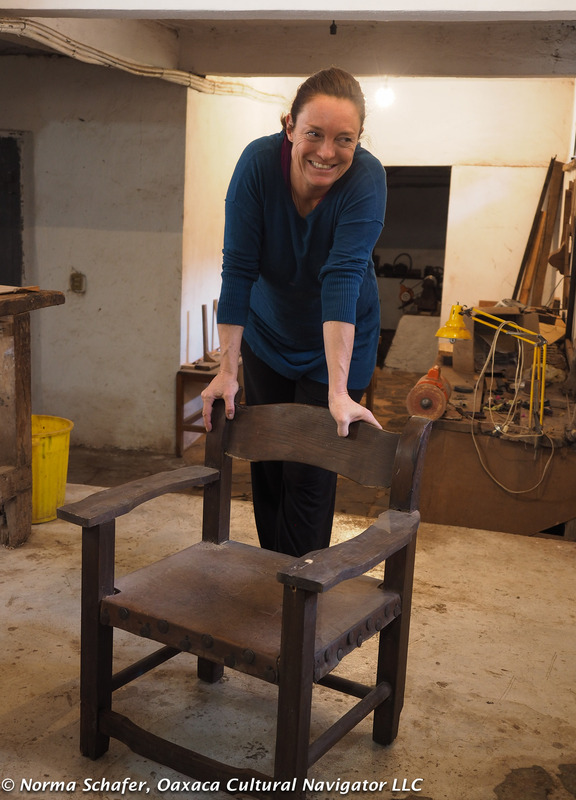 Meanwhile, Brigitte continues to develop new ideas, most recently implemented in wood sculpture, too. 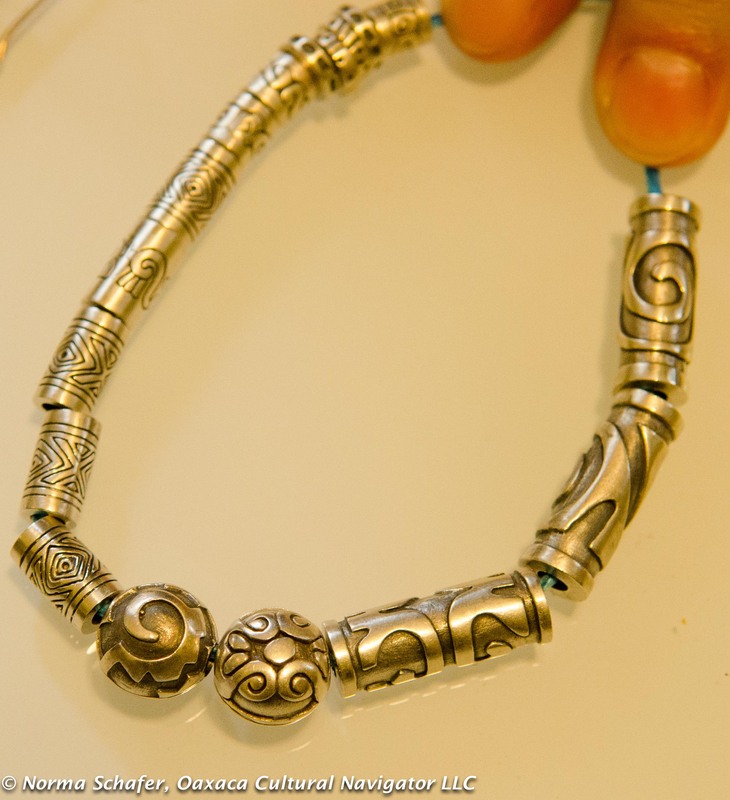 Eagle bracelet, small is 6-1/2″ x 2″, $550. Longer is 7-5/8″ x 2″, $600. 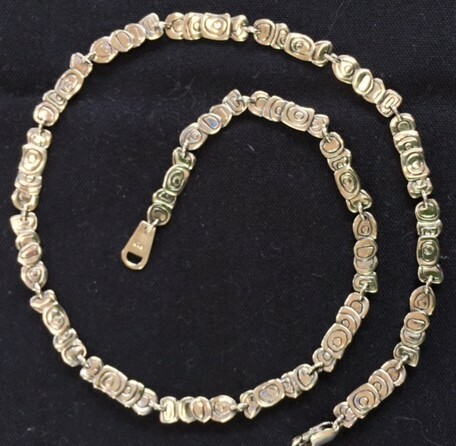 Bracelet, 6-7/8″ long x 1″ wide, $445. 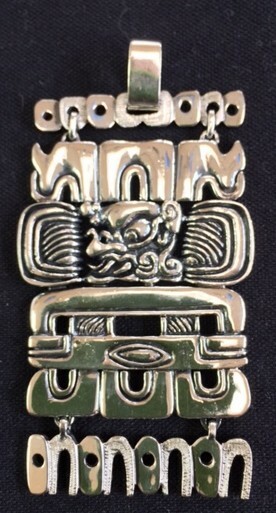 Eagle pendant, 3-1/2″long x 1-5/8″ wide, $245. 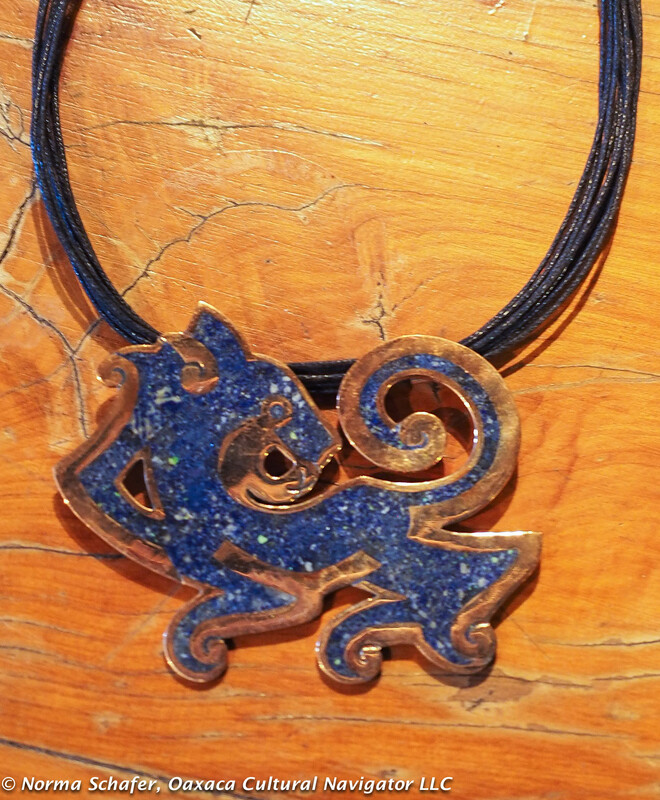 Pendant, 2-3/4″ long x 1-5/8″ wide, $275. 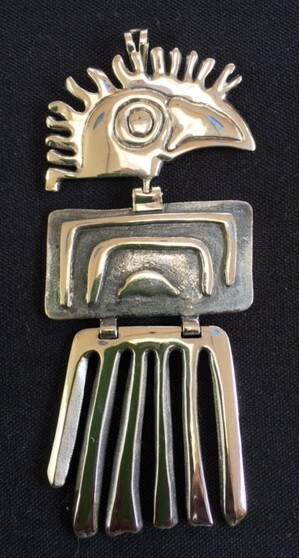 Lady Pendant, 3-1/4″ long x 2-1/4″ wide, $300. How to order: First send me an email. Tell me which piece you want. Tell me if you want insurance for the full value of your purchase. Order and pay by Monday, June 2: I will ship from California. Order and pay after June 2: I will ship from California after July 9. I will send you a PayPal invoice for the amount of the piece(s) and add shipping and insurance to the total. Upon payment, I will ship within one day if order received by June 2, 2015. P.S. I have no earrings or rings from Brigitte to offer for sale at this time. 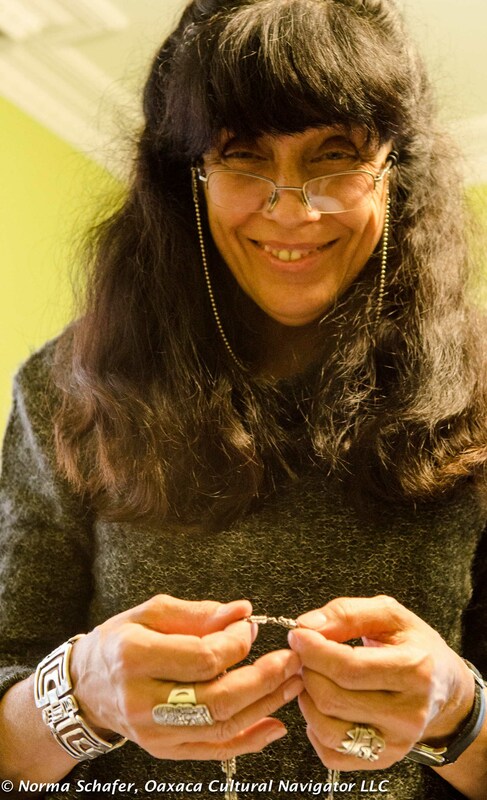 Our reunion with artist, jeweler, silversmith and dear friend Brigitte S. Huet has been in the making for over a year when Barbara and I first planned to visit Spain. 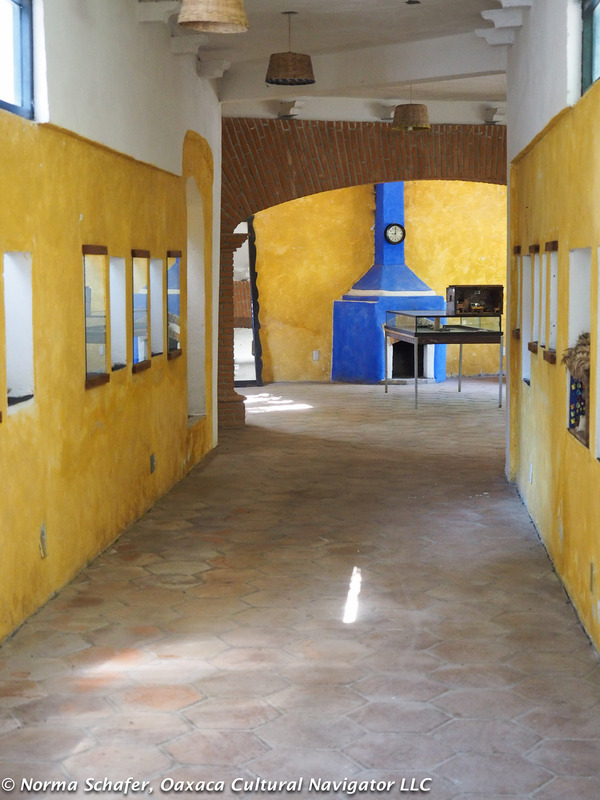 Brigitte and her husband Ivan returned to France in early 2014 after making Oaxaca their home and creative inspiration for over 20 years. We miss them. So, we made a meet-up plan for Bilbao, which is about four hours by car from the Toulouse area where they now live, to visit the Guggenheim Museum together. 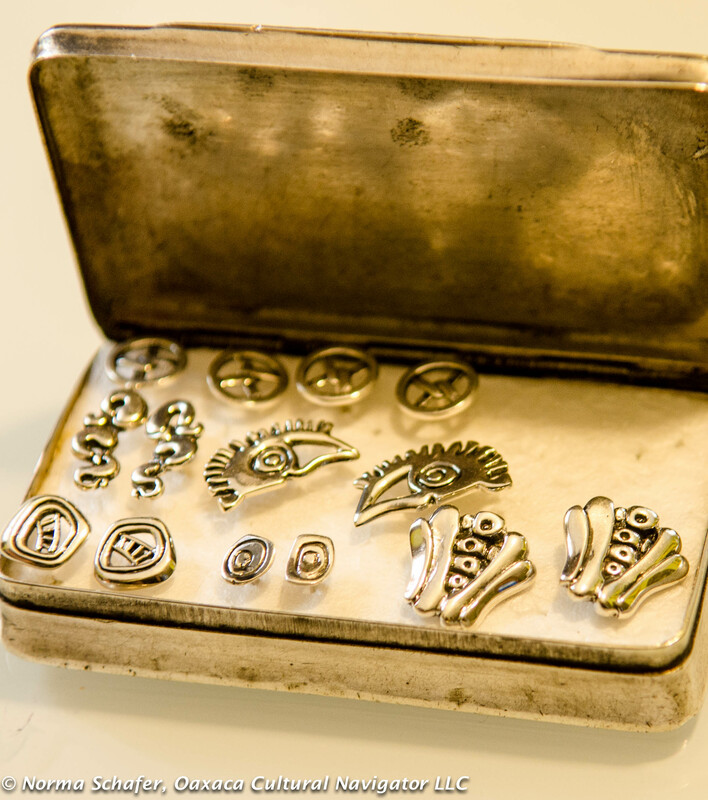 Barbara asked Brigitte to bring a trunk show of collector pieces she had created in the early years. We spent time looking at designs we had never seen before that had been tucked away in Brigitte’s treasure chest in France. 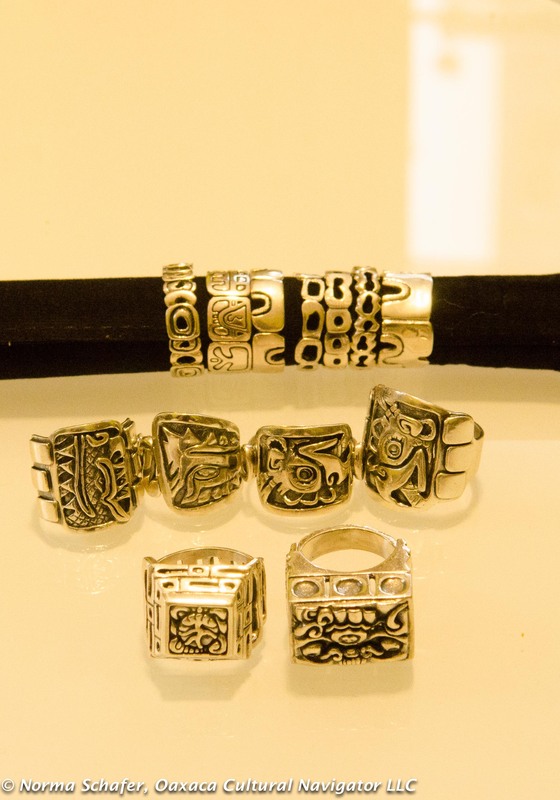 They included belt buckles, deeply carved silver beads, pendents, rings, necklaces, earrings and bracelets. 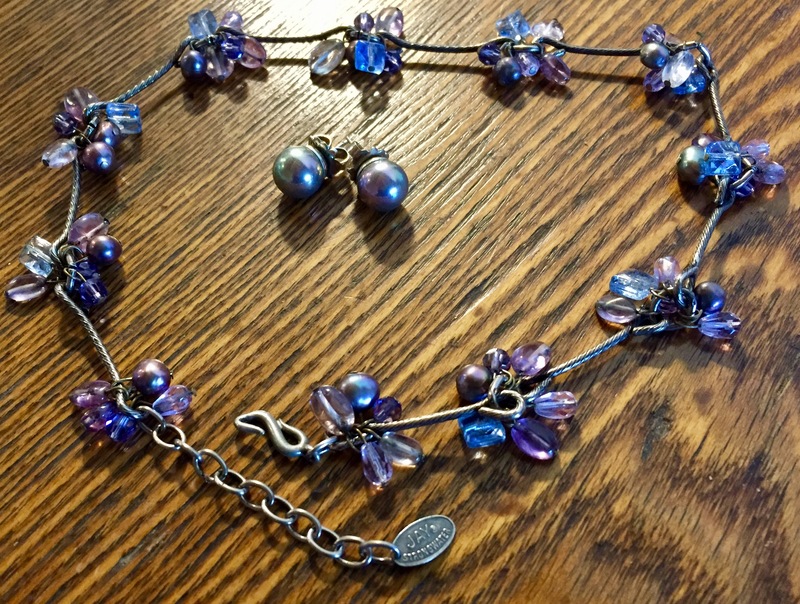 Some of these, mostly necklaces and bracelets, are now available for sale. I have them with me and I will be posting photos and prices soon. We reminisced, drank good red wine, ate stinky unpasteurized cheese, walked and giggled. It was wonderful to be with Brigitte again. They have not produced jewelry since returning to France. There is no place where they live now to set up a casting studio. 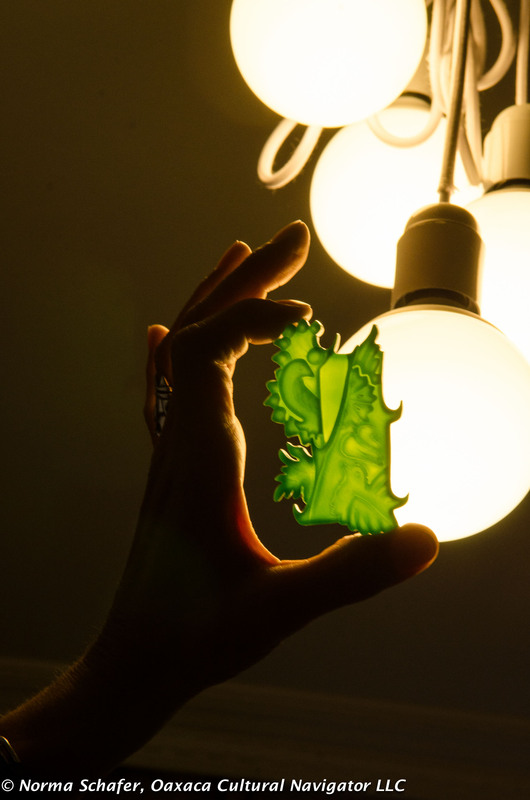 But, Brigitte has carved wax designs in preparation for what comes next and she has been carving wood, too. The creative life continues. Enviando besos y abrazos de Brigitte y Ivan de Francia. Sending kisses and hugs from Brigitte and Ivan from France.